Oh Sam, Sam, shall we go for a trek, Sam? 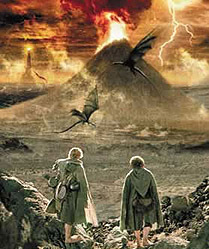 Why...sure...Mr. Frodo...After you! Mt. 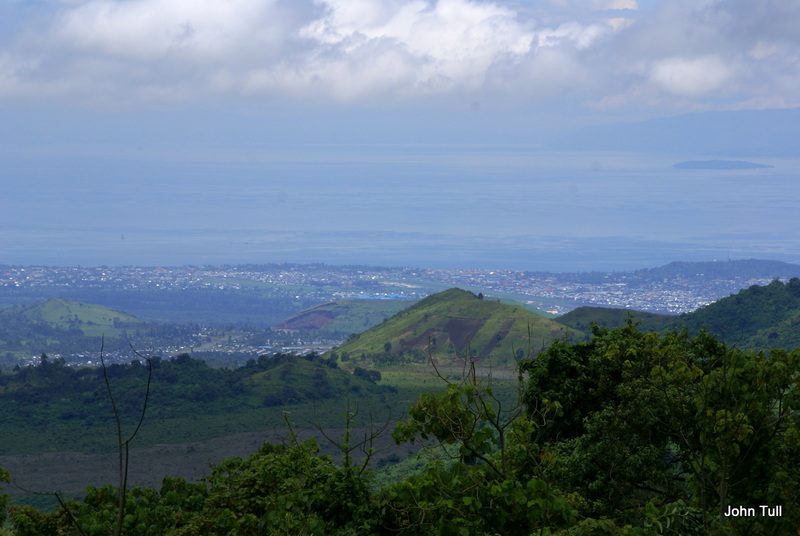 Nyiragongo, around 15 Km from Goma’s downtown, sits brooding over the landscape with dark menace. Towering 1,950m above the ‘mile high’ town, this 3,470m high volcano has erupted twice in recent history – in 1977, with almost 2,000 deaths in just 30 minutes of eruptions, and again in 2002 when over the course of two days, three rivers of lava ranging from 200m to 1/2 Km in width engulfed 40% of the city, 1/3 of the airport and pushed out some way into Lake Kivu (creating a new lake-side suburb!). 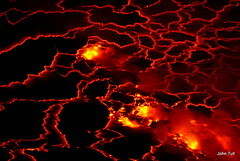 This second eruption, while devastating for the city itself, had far fewer casualties; the 1977 eruption had emitted the very fluid lava filling the caldera itself, lava that raced towards Goma at up to 100Km/hour and took no prisoners. 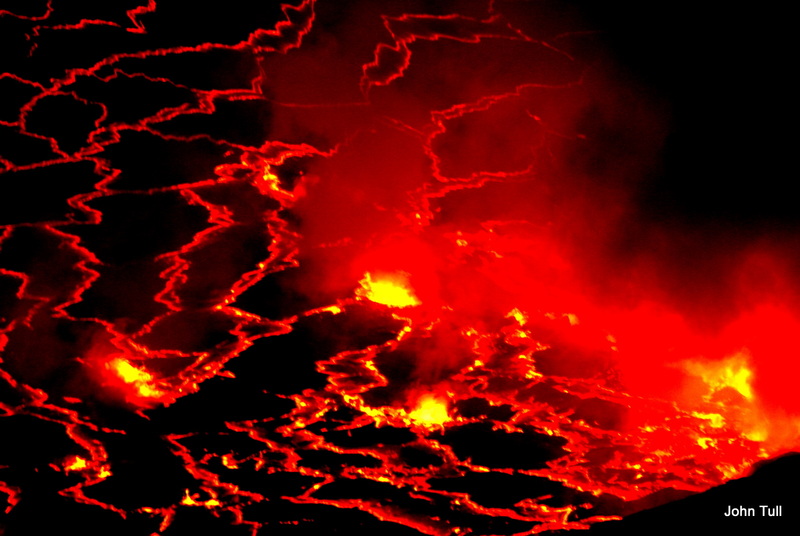 In 2002, when a side fissure burst open, thicker and slower lava flows emerged, giving quarter of a million people enough time to flee into Rwanda. 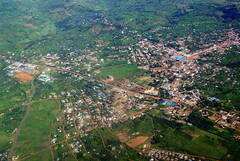 Goma was shattered, as widely reported by e.g. the BBC. Even with that slow lava however, horrible deaths occurred; the ruined cathedral downtown is a memorial to the dozens of credulous souls who had shut themselves into the church, believing their god would preserve them. 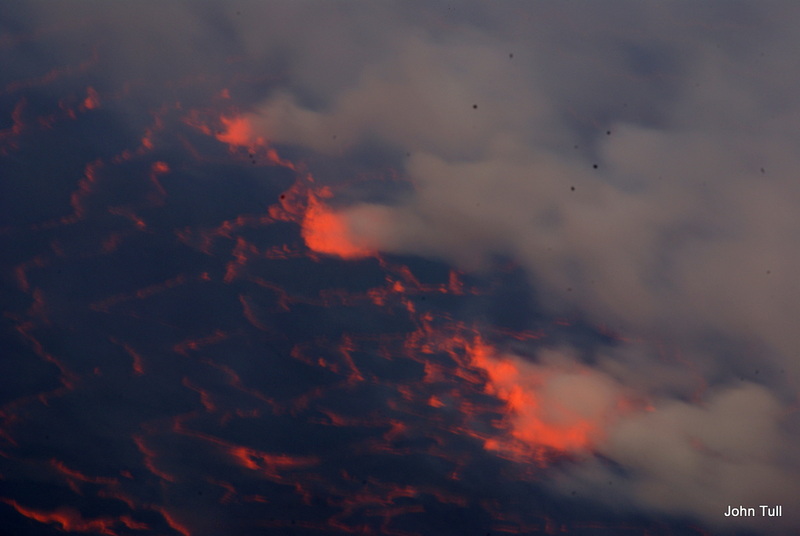 To the extent that modern vulcanology can track and predict, Nyiragongo is closely studied and updates are issued regularly –see here. Another ‘feature’ of this volcano was its occupation for 9 months by the feared rebel groups, supposedly cleared by joint Congo and Rwandan forces in late 2009 – I’ve mentioned the history of all this in my last blog entry. This lava + rebel history all seemed a little abstract at a distance however, despite the ever-present signs of rebuilding and the abundance of the grey-black lava rock being used for that rebuilding, and the ever-present armed forces around town (many restaurants and hotels have a “no firearms allowed” sign). More immediately and pressingly, we faced a logistical problem that threatened to keep us at a distance from the mountain itself. I had originally heard just a week before that Mt. 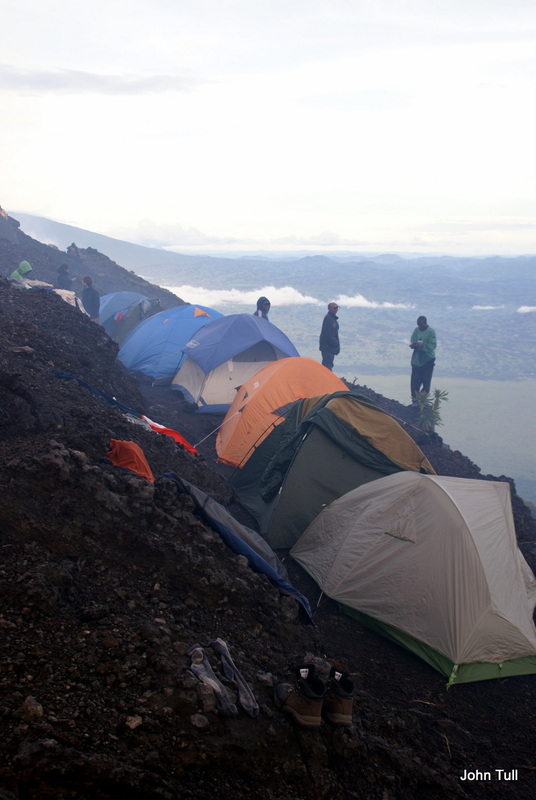 Nyiragongo was newly reopened for trekking from a friend of mine living in Goma. 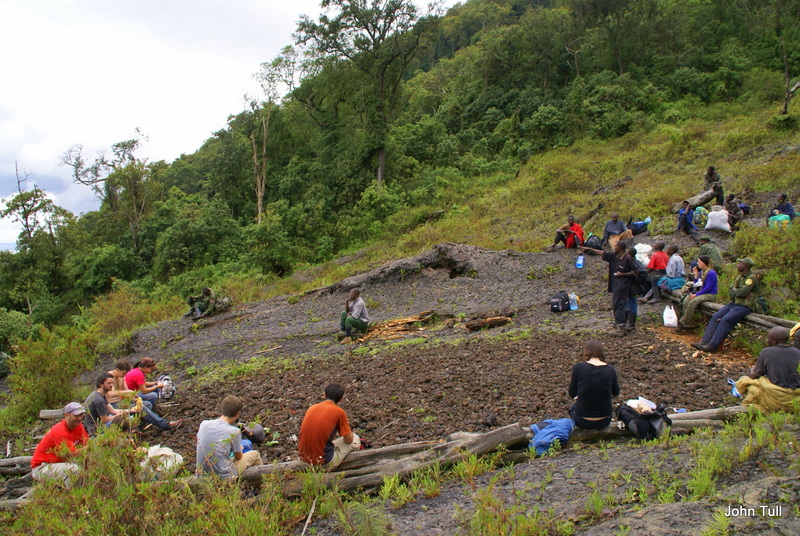 The trek had restarted from early March of this year, and as we later learned from the Head Ranger, 69 hardy types had made the ascent in March (and including us, 90 by Easter – as reported here). My buddy Joseph had sent me contact details of a Mr. Vianney who works at the ICCN official conservation authority in Goma; ICCN handle gorilla treks in Vurunga National park as well as the volcano treks. From a couple of calls and emails with the very responsive Vianney, I learned that he could facilitate a fairly straight-forward but mostly ‘do-it-yourself’ arrangement to get the permits, guides, tents, sleeping bags, transport and porters. 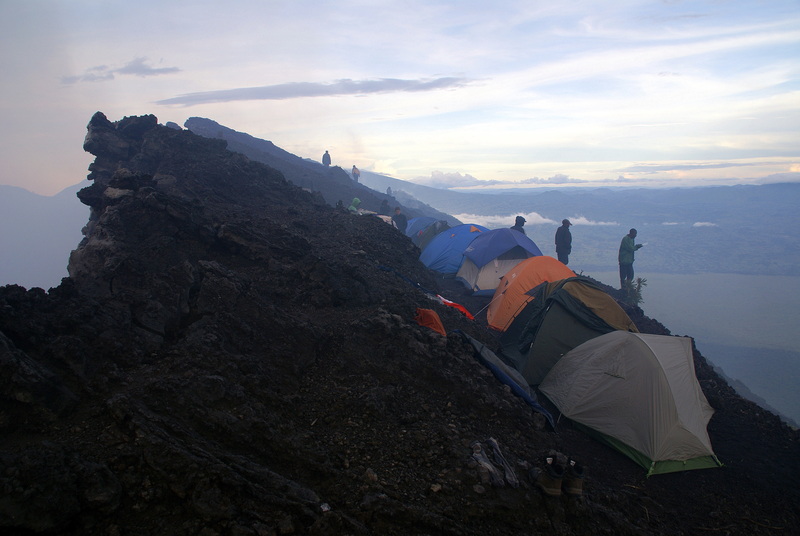 The costs were reasonable: US$200 per person for the permits, which also included the guides and guards; $10 for a tent, $5 for a sleeping bag; $24 per porter and around $10/person for transport to and from the mountain – a grand total of around $260-270. Food was to be pre-bought by ourselves. But the ‘do-it-yourselfness’ of the ICCN arrangement was slightly daunting – the permit process involved our having to get to the bank the day before, paying for the permits into a specific account, then rolling up to the ICCN office with receipts to exchange for the permits, and then choosing gear and guides on the day as well as arranging transport… From far-off Kigali, there seemed plenty of scope for one missing link to spoil the plan. One warning I had picked up from chat sites and travel blogs was to bring our own sleeping bags – rental ones are horrible, thin, torn or all of the above. We borrowed bags from friends instead. Tent quality was also a known issue – warnings abounded about leaky tents. When an alternative to DIY suddenly turned up – an email just a day or two before we set off to Goma, from some American guys who were looking at the same weekend and had been making arrangements via a local tour company – and the cost for what seemed to be a ‘package deal’ was only another $20-30 more each, I put the option to our party and the vote went the package deal. 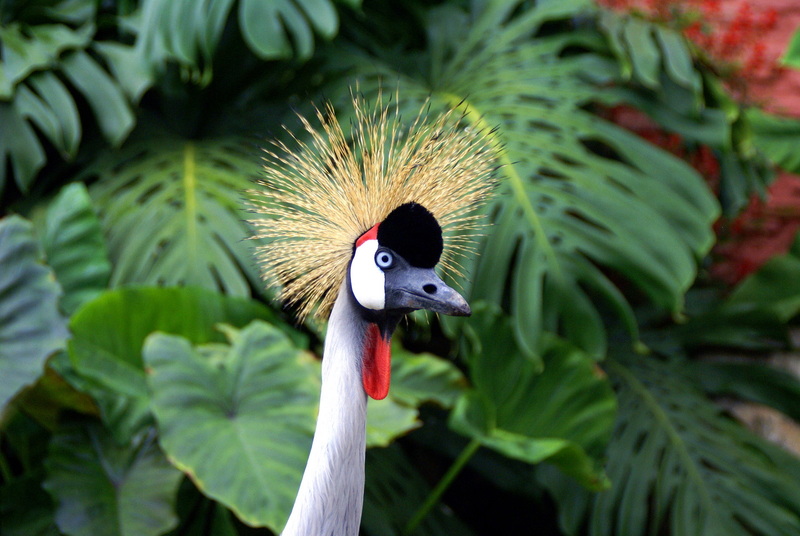 After a bit of back and forward – the Americans were flying in from Uganda, one of our group was coming in from Kenya – we said yes and received confirmation of the booking with a Rwanda-based tour operator. I informed Vianney, who was gracious about our cancellation. 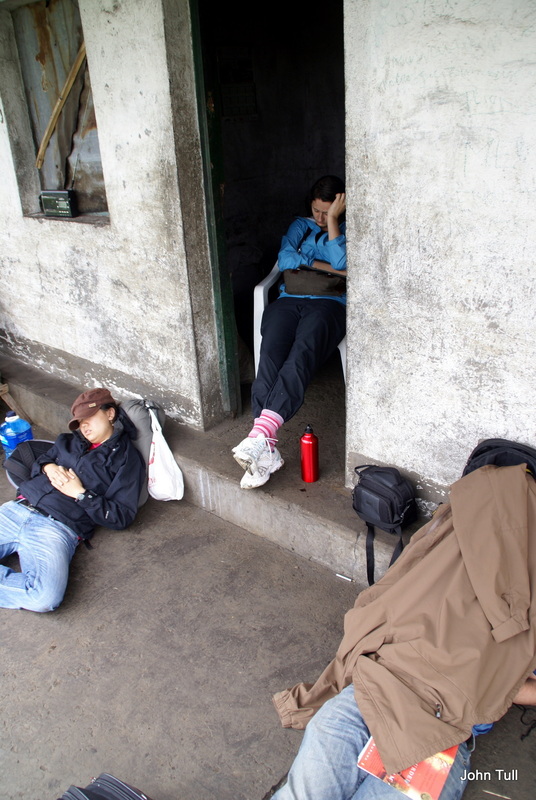 Fast-forward to Goma and the morning of the trek: no contact from the tour company. No money had changed hands, so we thought that gave them plenty of incentive to make it all happen. But after a few text messages and phone calls we ascertained that the tour operator had failed to get us permits for that day (numbers are strictly regulated); while they hadn’t asked for a down-payment, they also hadn’t told us that they relied on us physically being in Goma to do the rounds of the bank and the ICCN office… slowly we realised that the ‘package’ was wearing a bit thin. A few frantic calls to Vianney ascertained that 1-2 of our party could have joined that day’s climb, but as it would be with complete strangers we had no takers. ICCN office next, and after a wait we finally met Vianney who dealt with the hour-long process of issuing us with 7 permits in as professional a manner as possible. By now I had realised we should ‘unpick’ the deal with the tour operator – we were doing it ourselves, it turned out, with just some guidance. We agreed amongst ourselves to start calling the shots and save some money. The local operator, Emmanuel (who we later got to know quite well and think is a generally good chap) had been told to secure 4 porters for the 7 of us, which sounded like profit-maximisation (we were still being quoted a per-person fee). When I asked for advice, Vianney rightly laid out the right proportions: each porter should carry a maximum 15Kg, and with tents, our backpacks, big water bottles, food and charcoal that meant one porter per person. 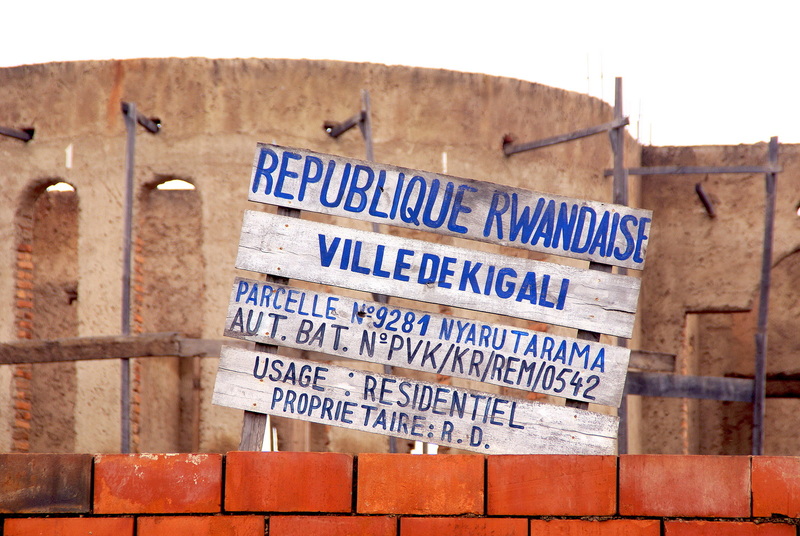 We had to gently shout down the Rwandan-based tour operator who insisted by phone on just 4. 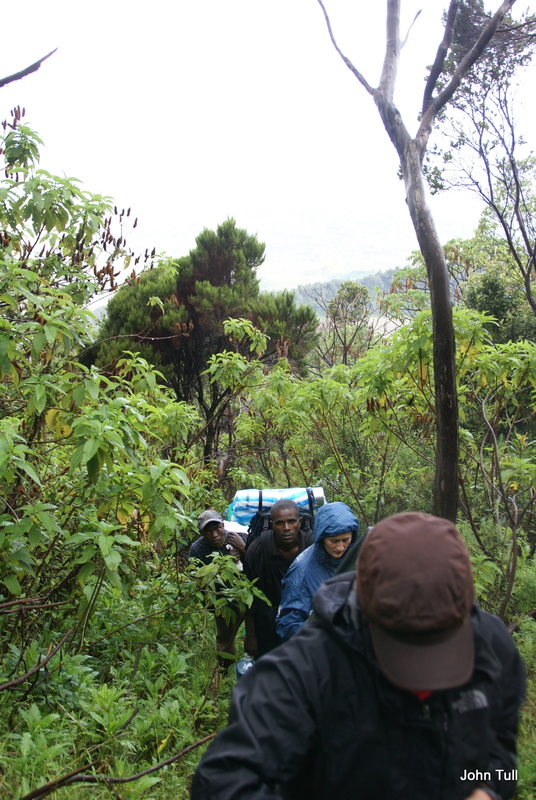 And on it went… we ended up hiring the porters and tents directly ourselves via Vianney’s help, and arranged with Emmanuel for transport; he also collected a commission on the permits bought. Then it was on to the foreigner-targeted supermarket where eye-watering prices for everything demonstrated what 200+ NGO’s can do to an economy: two cans of fish-meat, some bread, juice and a 5L bottle of water set me back $23. Next day, the mountain; and in what is fairly common in societies where ‘face’ can be more important than accuracy, the assurance we’d received that we could make an early start to beat some of the mid-day heat amounted to nothing. We even missed breakfast at Hotel Ihusi because they couldn’t get their act together to open the restaurant on time at 6am. We drove out to the trek starting point early; sleepy but pumped, we assembled all our gear, we had our permits registered in a big ledger, and then…we waited. Three hours later and finally we got underway, still unaware of why we couldn’t have been informed an early start was never on. The first 90 minutes or so was bush walking on a moderate slope through dense vegetation, two armed guards up front and two more at the rear. After that, the terrain opened out into an increasingly steep slope of loose volcanic rubble, interspersed with large patches of very solid footing where lava had flowed. The upper slopes of the mountain were shrouded in cloud but as we climbed higher the views across the wide valley and back along to Goma and its Rwandan sister town Gisenyi, set on the shore of Lake Kivu, were lovely and ever-shifting as we got above the cloud-line in the valley itself. Rest stops came about every hour, which was just as well as the air thinned and muscles started complaining. Half-way up, the rain also came – inevitable in rainy season. For the next couple of hours we trudged through alternating heavy showers and drizzle. Then finally, still several hundred metres above us, we could see the final slopes of the volcano itself, and the plume of sulphurous gas it emits continuously. Finally, this looked like a real volcano trek. A side detour to see the great fissure where the lava that ate Goma in 2002 had emerged, surrounded by small fissures that still hiss gas, brought home viscerally that this thing is alive! Another hard hour of climbing brought up to a wind-swept lean-to made of sheets of metal, on a little plateau still 200m of altitude short of the summit; apparently some trekkers can make it no further and stop here for the night, as do trekkers who may have forgotten (!) to bring a tent. The last section was really tough work; even looser surface, and, at well over 3,000m altitude (nearly 2 miles above sea-level), a bit of a breathless slog. And then suddenly: the summit, which on a volcano is a rim, and a narrow one at that. The guards stood nearby anxiously warning each new arrival to stand back from the very edge… we had all heard of the Chinese tourist who’d taken a step too far (memorialised with a small cross); the guards clearly didn’t need the paperwork of dealing with another one! We’d reached the summit in late afternoon. The caldera itself was generally obscured with seething, mildly sulphurous gases. 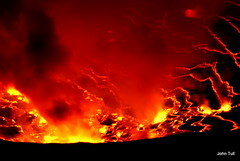 With each change in breeze, though, we could see part of the lava lake itself, looking in the daylight more like a large flat area of smouldering embers than a maelstrom. Pretty cool sight, but not so spectacular as to distract us from ‘doing the needful’. Tents were being pitched and in the remaining hour of daylight we scrambled around finding bags, unpacking some dry clothing, and getting the lay of our (small – very small) piece of habitable volcano rim. That habitable space is a single rock ledge, just long enough for 5-6 tents end to end, and just wide enough for careful movement past the tents. One step too far, and valley-side it would be a steep unbroken slide down abrasive volcanic rock for maybe 500m… one wrong step the other side, and it is a 200m fall to some crater ledges and from there another 300m or so down to the lava lake itself. So the choices were simple: being flayed by volcanic rocks; being braised by volcanic lava jets; or being very bloody careful where you stepped so that you lived to blog about the tale. By the time we’d each had a simple meal of tinned fish and bread, distracted by the seemingly futile attempts of the guides to get a small charcoal fire to light, darkness had begun to fall. 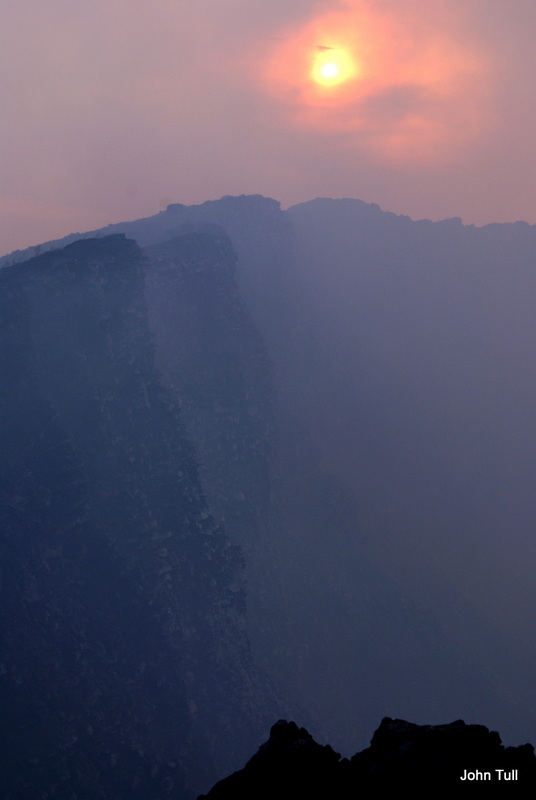 Cameras in hand and with the guards keeping a watch for hasty mis-stepping, we climbed back up the 5m ridge that separated our ledge from the crater itself, and finally there it was – the lava lake emerging in fiery reds and yellows from the dusky gloom. The sight is mesmerising; while gas plumes waft around, obscuring one moment and revealing the next, the lava lake seethes with implied forces that roar and crackle below. 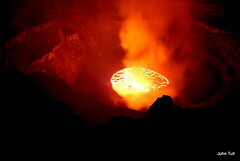 The lava lake is an oval of about 900m in length, 800m in width, of highly liquid lava. The thin surface crust is fractured and re-fractured constantly, like the glaze on a crème caramel. Unseen rippling forces erupt in one area and then quickly spread across a region of the lake; then another area spurts into life, sometimes with distinct jets sputtering away and spewing lava onto the rock surrounding the lake, and other times as a curtain that unfurls from the edge of the lake with bubbling menace and new plumes of gas. It was cold up there, exposed to the wind which only gradually died down; damp clothing and no hot food added to the chill, occasionally mitigated by a gentle blast of lava-heated air sent our way. As night fully set in, the colours became ever more intense; when the wind died for a moment the gas plume visible as an orange fog above the mountain from Goma would stand as an immense pillar of lit gas rising kilometres above the volcano, lighting up the 2Km-distant opposite walls of the caldera like a cathedral lit by candles. I stood up there for over 3 hours taking photos and some video, but mostly just enjoying this primal force that far pre-dates any form of life itself. Fireside yarns from Emmanuel around a weak charcoal fire, wet footwear slowly baking in a cranny near the fire, then it was time to try to sleep. Four of us shared one tent; the trick was to pull on every bit of dry clothing, jam on a woolly hat, zipper up the sleeping bag as tightly as possible, and then try to ignore the many lumpy rock shapes pushing back cynically in all the sorest spots… When what sounded like near-gale force winds whipped up during the night, conjuring up images of being whipped away Mary Poppins style back to Goma, sleep was something only to be diarised for a future night. The next morning found all tents still pegged in place on the ledge and all inhabitants accounted for, sore, cold and hungry but nonetheless alive and well. Within an hour we were about ready to head off; but first the guides burst into a lusty song to shake out the cobwebs and cheer us on. Going down should be a little easier, the optimist in me said, but rough terrain, an innate clumsiness and the wrong choice of footwear proved me wrong. The broken rock surface was tough enough climbing up; coming down, it was treacherous, especially because I was wearing sneakers which proved to have no real grip. The first fall jolted my back as well as costing me a small patch or two of skin on hands and arms; the next couple gave my left knee a good whack and started to dent my joie de vivre just a little. I will spare the gory details, but let’s just say a fair dose of bruises and abrasions is a good illustration of what a mistake it is to weak sneakers on a volcano trek. New Balance sneakers at least; by half-way down the mountain, I would have cheerfully pitched them into the lava lake if I had the chance. Long post, but I hope I have related how special this trek is. Mt. 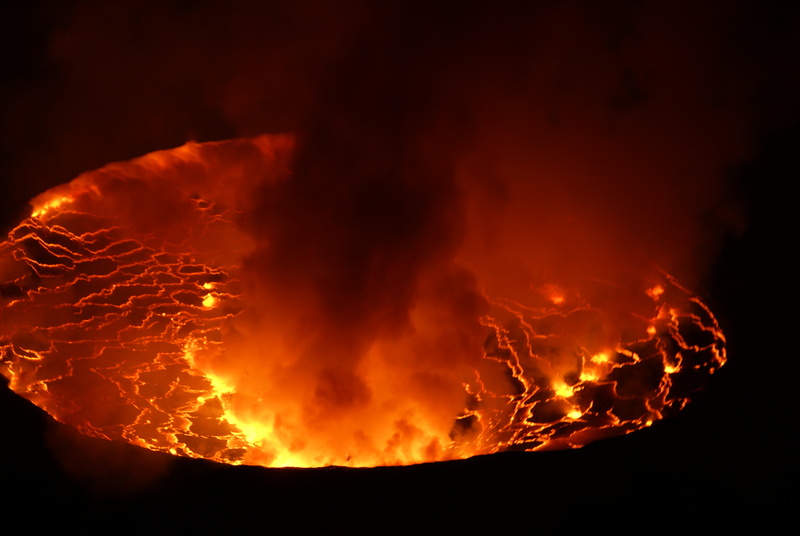 Nyiragongo is one of the few “must sees” that I’d recommend for anyone with the fitness for a moderately strenuous outing. The news that the trek has re-opened is just starting to get out (as seen in this recent NYT article) that tourists are once again able to come see this awesome sight – although it subsequently shut again soon after, so check with tourism authorities first. 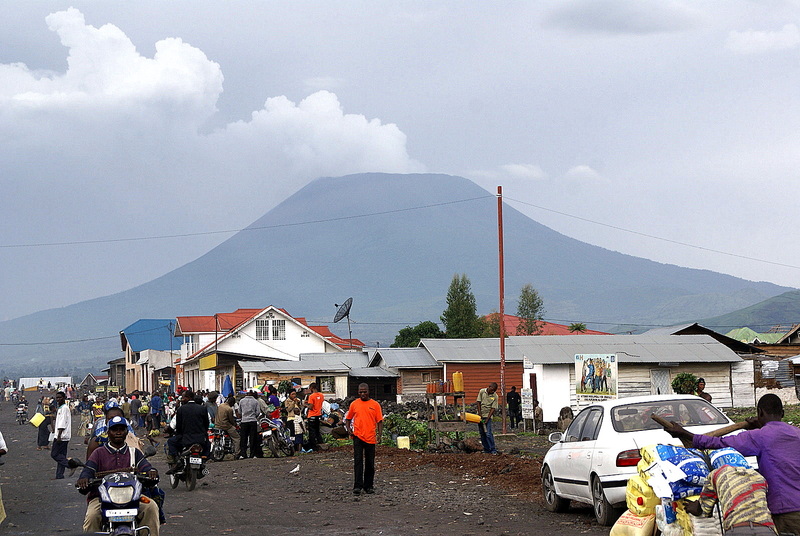 A good recent article on the economic aspects of volcano tourism is by Jon Rosen, a foreign correspondent based for some time in Rwanda; it is available here. Hopefully the influx of trekkers will provide sustained employment and further incentives for tourism – not terrorism – in this all-too-frequently blighted part of the world. Ascent: 5-6 hours, including about one hour of rest-stops. Need to be at least moderately fit. Descent: around 4 hours, or longer; quite tough in places (jarring, slippery). Wear hiking boots, not runners! Overnight versus (for the really fit) day-trip only: the night display by the volcano is not to be missed! How to Book and What it Costs: The three tour companies I’d contacted had quoted between $280 to $420 per person, depending upon numbers in the group, how much the operator is skimping (on porters etc) and greed. For 7 people we got it down to $260pp from Hakuna Matata; but they dropped the ball logistically. “DIY” via ICCN will be around $260-270 (note: unless you are trusting enough to somehow pay a tour operator in advance, you will do plenty of ‘do it yourself’ anyway). To save money, contact Vianney at ICCN directly (theirs is a no-fee service): tel./text: +243995693627 / email: tourism@gorilla.cd or jmvianneyh@yahoo.com . While you will need half a day to make the arrangements directly in Goma, his emailed instructions are clear and accurate. 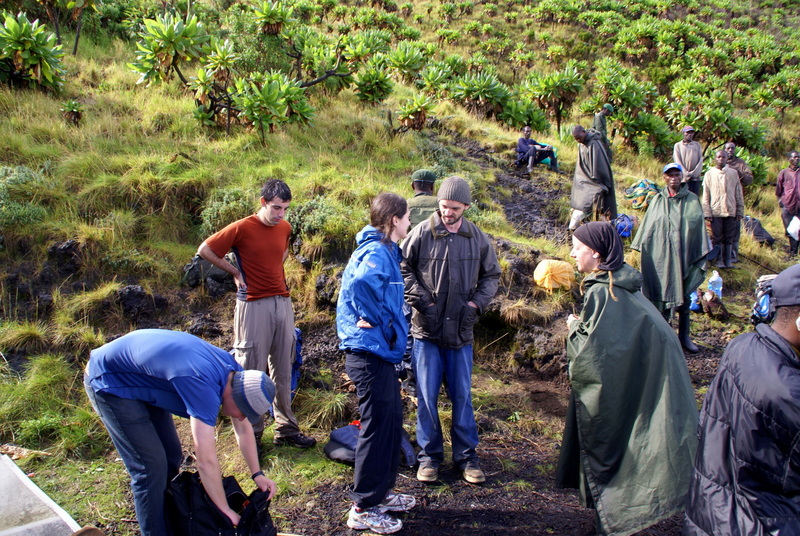 You must pay for the permits at least one day before the trek, numbers are limited. Clothing: bring wet weather gear in the rainy season, including a change of warm clothes and footwear (temperature drops to just 3-5 degrees above zero at night, especially with wind-chill). 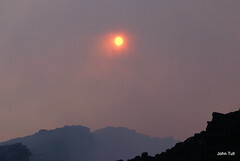 And of course bring sunscreen, a torch and a camera (with tripod if possible). Tent/sleeping bags: we rented two tents via ICCN; one was ok but had a dodgy zipper, the other lacked a rainproof layer and we used it only for bag storage. Sleeping bags: bring your own if possible, including a mat to ward off the hard, lumpy ground. Phone: surprisingly good cell phone reception from the peak. ‘Boast’ calls are almost de-rigeur! Tips: no set rules, but clearly expected; we gave our individual porter, plus our guards, $5 each as a tip. As a group we paid $40 for Emmanuel to accompany us for the day & a half trek, for his great stories. 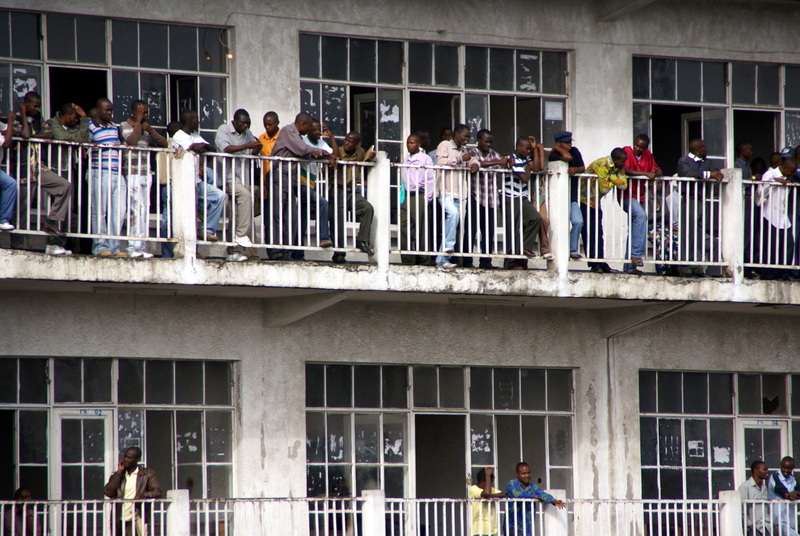 Getting into Goma: crossing the border is usually done at Gisenyi. There are two crossing points in Gisenyi: one right up in the town market area, the other a 1 Km walk/ride down by the lake-shore. 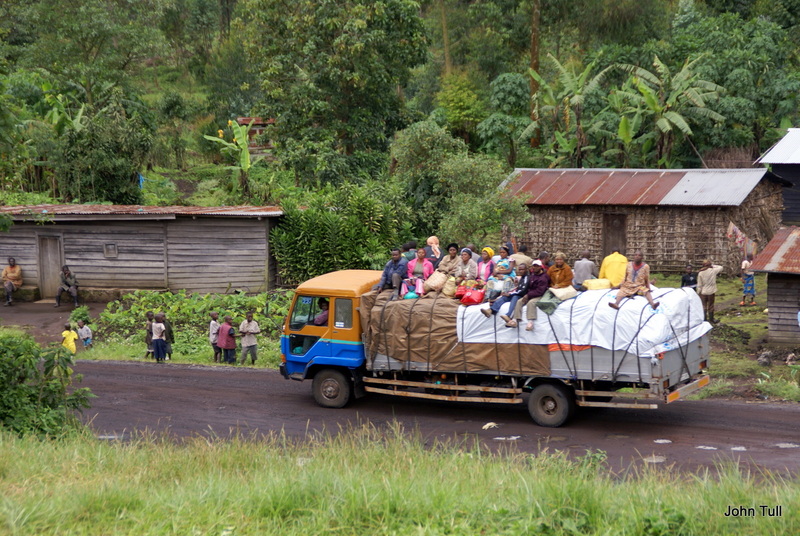 We used the lake-shore crossing and had no problems at all – paperwork galore of course (we took 45 minutes for the whole process, exiting Rwanda/entering Congo) – but friendly, helpful staff on both sides. Even a group member who arrived at 9pm alone was treated fine. From what others told us, the market area crossing is more troublesome — two people we met had been hit up for extra ‘fees’. The other entry point is down at the southern end of Lake Kivu, at Butare; again, the hear-say we received was that this is a really problematic crossing point and should be avoided. Visa for those requiring it: $35 single entry. Showing a Yellow Fever vaccination card is mandatory. I had the opportunity back in December ’09 to pop across from Gisenyi to Goma, after a few of us had done the fabulous trek to see the Mountain Gorillas. 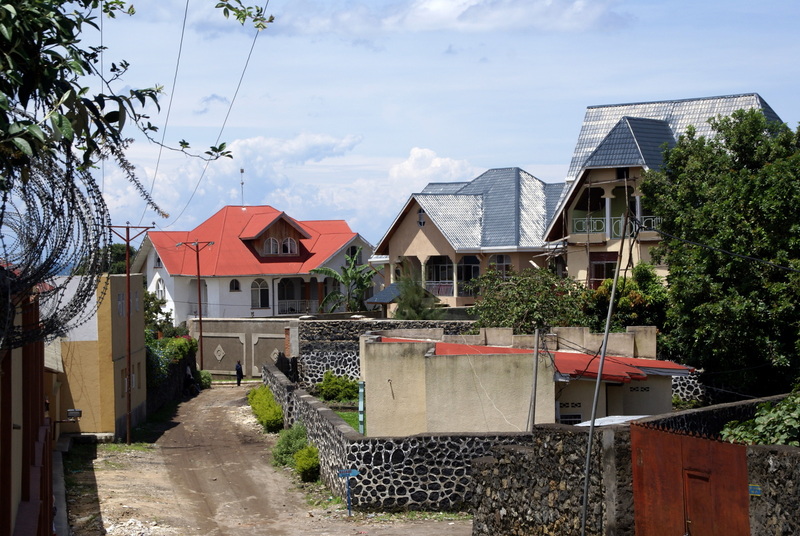 Three of my colleagues decided to do a quick trip to visit Goma and maybe even get to see the volcano only a dozen or so kilometres out of town. 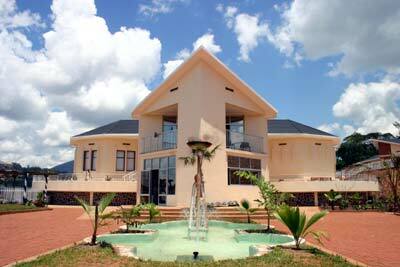 I passed on that and chilled out at the Rwanda-side hotel’s private beach. Only 4 hours later, they returned, slightly breathless with the daring-do of the trip they had just made to what they described as a virtual war-zone of dilapidated buildings, broken roads, razor-wire and edgy UN troops. They’d managed to get beyond the town perimeter to play around in the lava fields, but got only half-way to the volcano foothills due to reports of rebel activity. 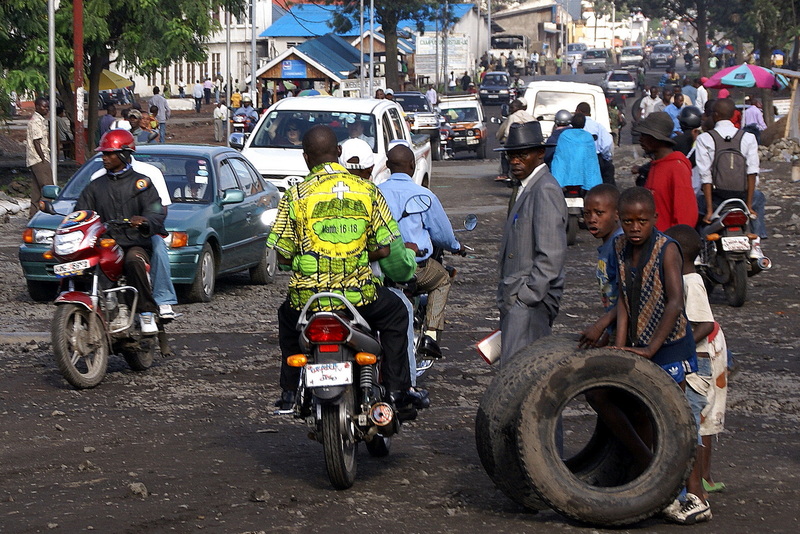 Early April 2010, and it was time to set this right with a real trip to Goma. 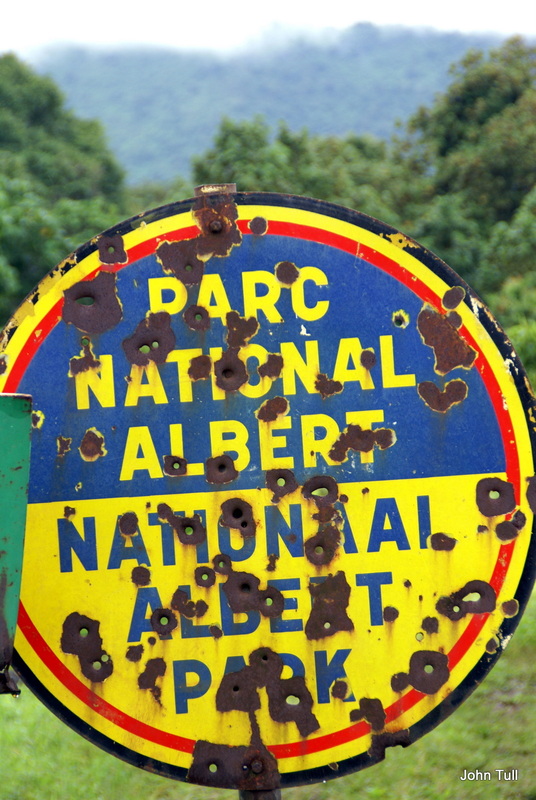 Information was sketchy – there hasn’t been a roaring tourism industry in Eastern Congo in quite a while. Five of us decided to go, after checking out UN and UK websites for consular corps advisories, and we divvied up the work of piecing the trip together. 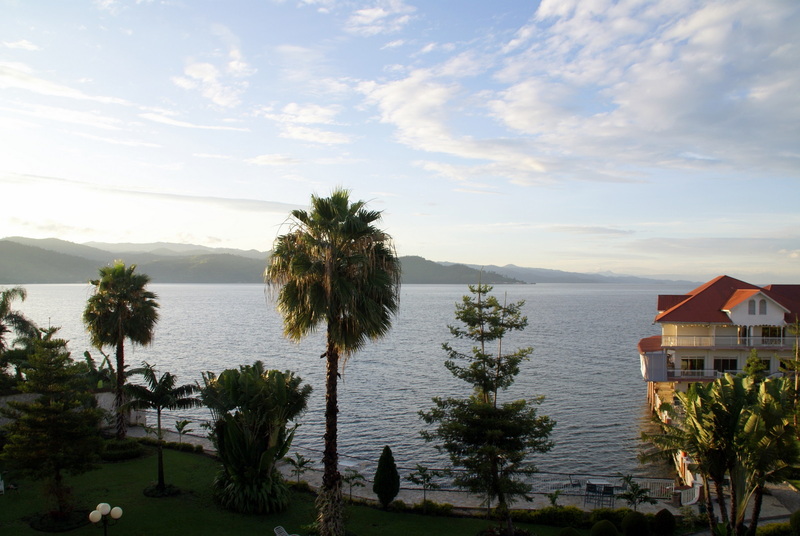 The aim was to spend 3 days around Goma, perhaps seeing the volcano or the gorillas, take a boat down Lake Kivu mostly for the views (Congo one side, Rwanda the other), and then have maybe a day in the Nyungwe rain forest in South West Rwanda before heading back to Kigali late on the 5th day. 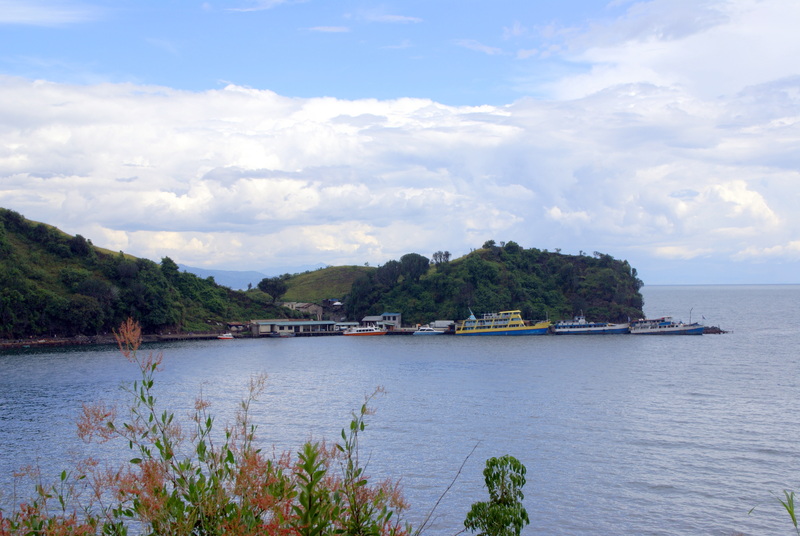 The boat trip from Goma to the southern end of the lake, a town named Bukavu, takes 3-4 hours by speedboat (US$50/person), or 2-3 times that long by slow overnight ferry. Goma had been given a poor rap by one of the three colleagues who’d gone there in December… danger, dirt, scary people, demands for bribes, guns… and this fear message spread to the point where a potential sixth member of our trip talked himself out of going just a week or so beforehand and instead went off to a quiet, safe lake in Uganda for the weekend. This volte-face by our erstwhile colleague was not completely ill-founded; in fact in sober, reflective moments before traveling the risks seemed fairly daunting. 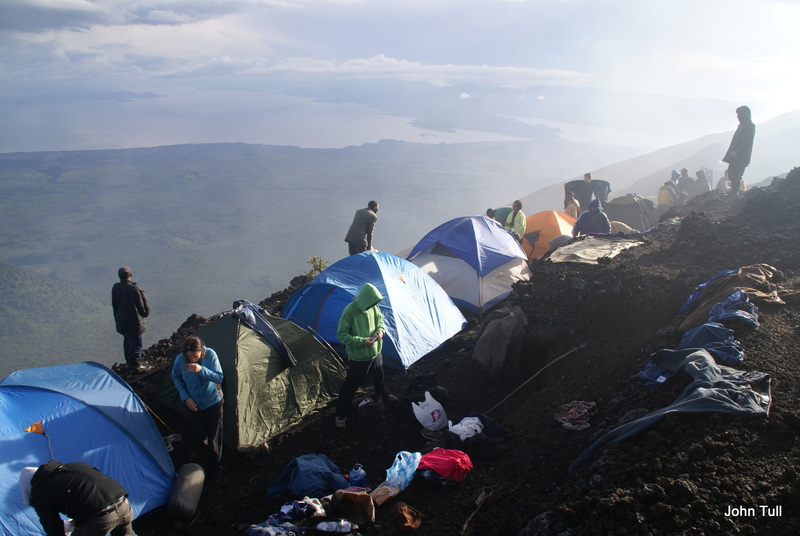 Goma presents not one, not two but three major risks: rebels, volcanoes and a deadly dangerous gas bubble. First, Rebels: even after two major wars between the Rwandans and the Hutu regime who’d fled with tens of thousands of genocidiers/fighters to Goma in 1994, along with a massive number of Hutu civilians. Kinzer and other authors point to the bitter irony of the huge humanitarian effort that followed as these 1 million refugees were cared for by international agencies, while the blood in Rwanda still leaked into the gutters of Kigali. 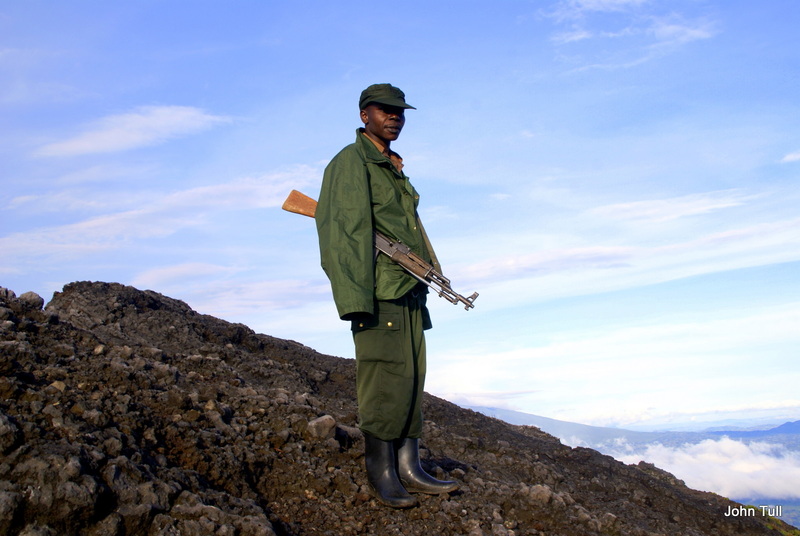 Large numbers of these killers remain at large, occupying areas in the forests and mountains around Goma. So deadly has this conflict been that it is estimated 3-4 million people have died, mostly innocent civilians caught between bullets, rapists and fatal diseases. 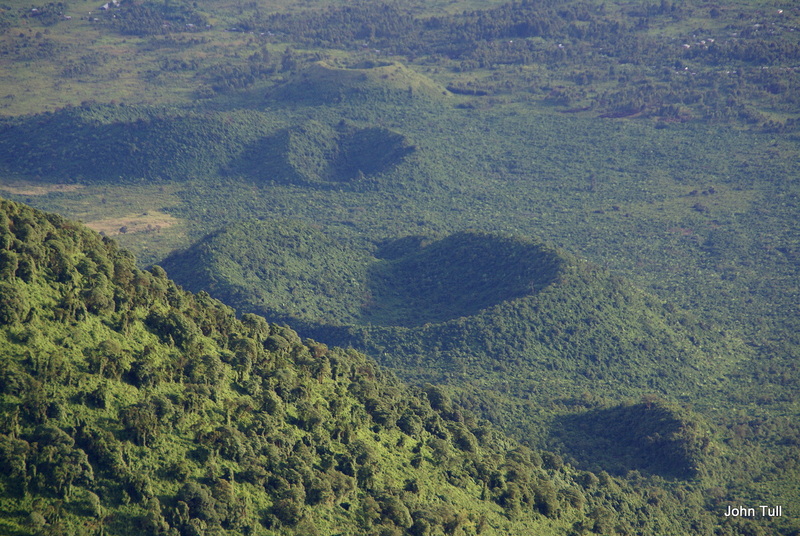 The rebels were only cleared off the nearby volcano in February 2010. 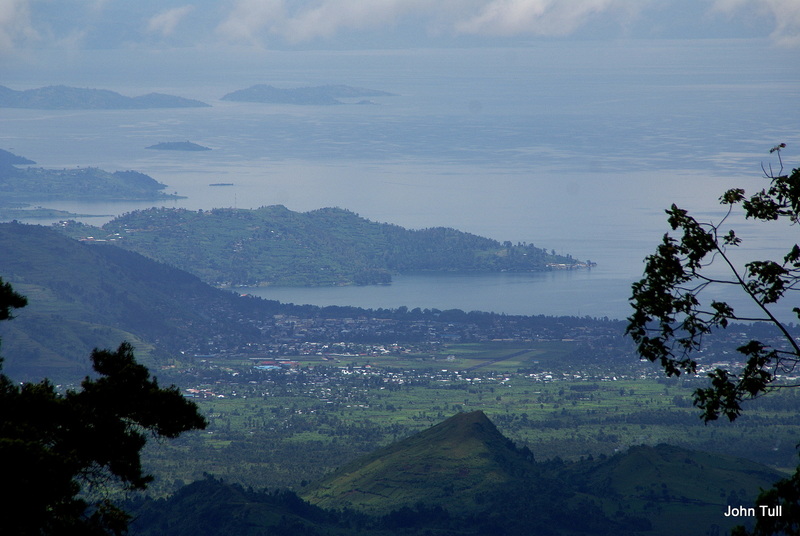 Second, Volcanoes: the volcanoes near Goma (there are several) are frequently active; the nearest one, Mt. 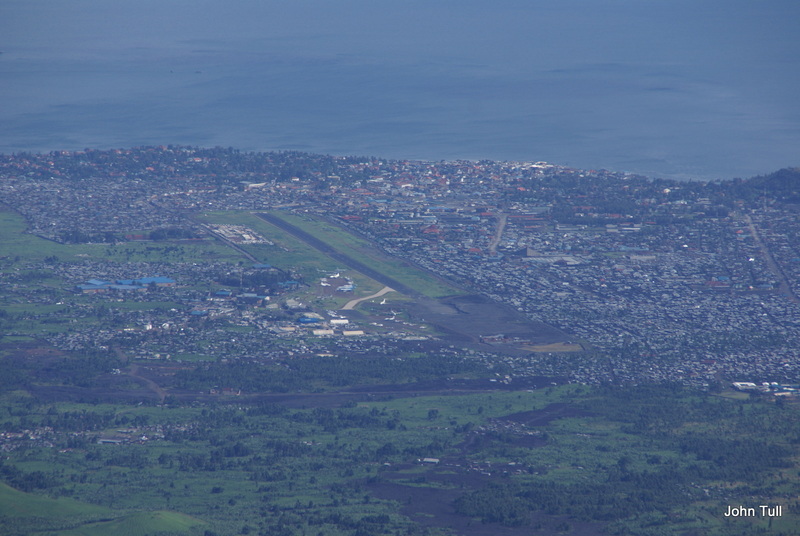 Nyiragongo, just 15 Km away, sent a river of lava through Goma in 2002, destroying 4,500 buildings and covering 40% of this city of 200,000-300,000 (no-one knows), including 1/3 of the airport runway. And then third, there’s Gas: the massive carbon dioxide gas bubble under Lake Kivu is apparently 2,000 times larger than the one that killed nearly 2,000 people in their sleep at Lake Nyos in Cameroon in 1986…it’s all just waiting to happen, if it can’t be tapped and extracted in time. In other words – what’s there to worry about? One confidence-restoring factor about going to Goma was that a friend from Johns Hopkins had recently relocated there from Kinshasa right across on the other side of Congo. Joseph is an urbane, intellectual guy – not known to be a dare-devil. When I had pinged him by Google chat to ask how he found Goma, his reply was “Chaotic, busy, crazy… LOVE it!” Joseph works in a relief agency helping farmers restore their lives after being relocated. When he later told me he had just trekked up the volcano, Mt. 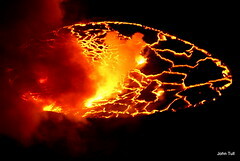 Nyiragongo (a later post), and spent time warming his toes over a lava lake, that sealed the deal — we were going! 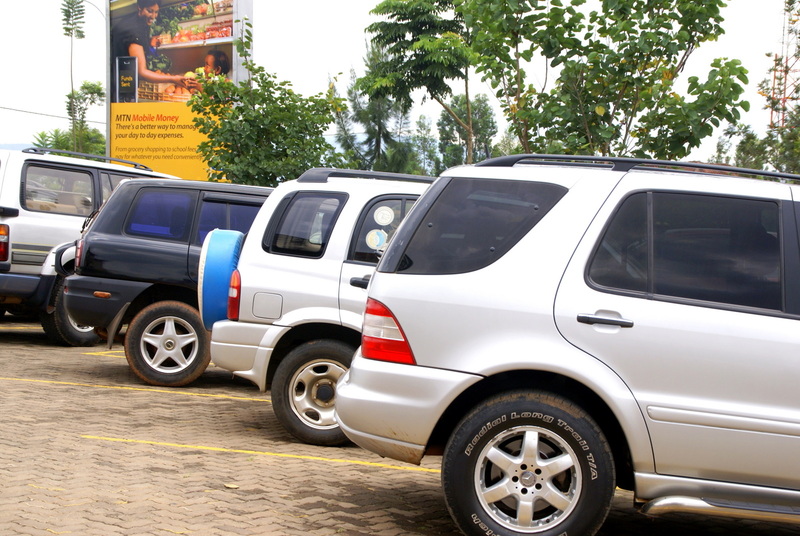 Getting to Goma from Kigali is straight-forward. One of our party, flying in from Nairobi and delayed several hours by a heavy fog over Kigali, took a car at a cost of $150 one-way. 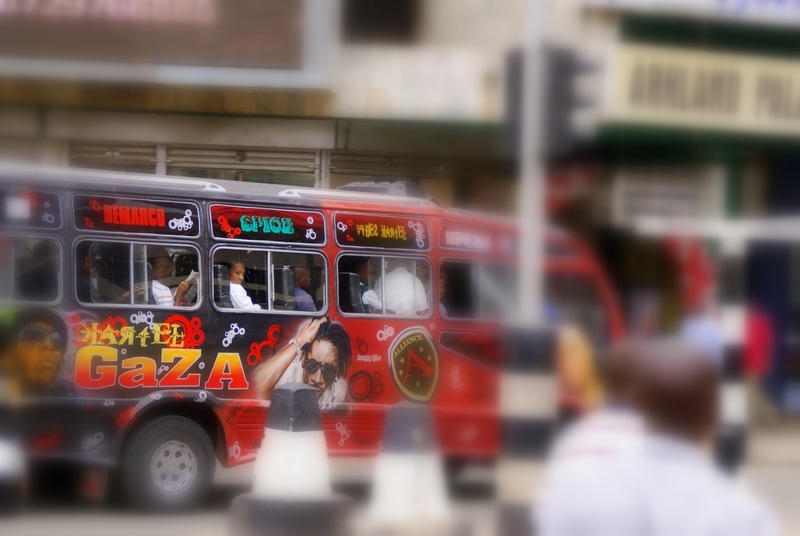 We locals just took a mutatu, the long distance mini-buses that jam in the passengers (but only as many as there are seats, including the fold-down ones running down the aisles — unlike Kenya and elsewhere, where bodies are simply jammed in any which way). For a princely fare of Rwanda Francs 2800 (about US$5) the 3-3.5 hour trip was paid for and, right on the nail, the bus left Kigali at 7am. At Gisenyi, the town on the western side of Rwanda situated right by Lake Kivu, we disembarked and found our way to the Rwanda-Congo border. 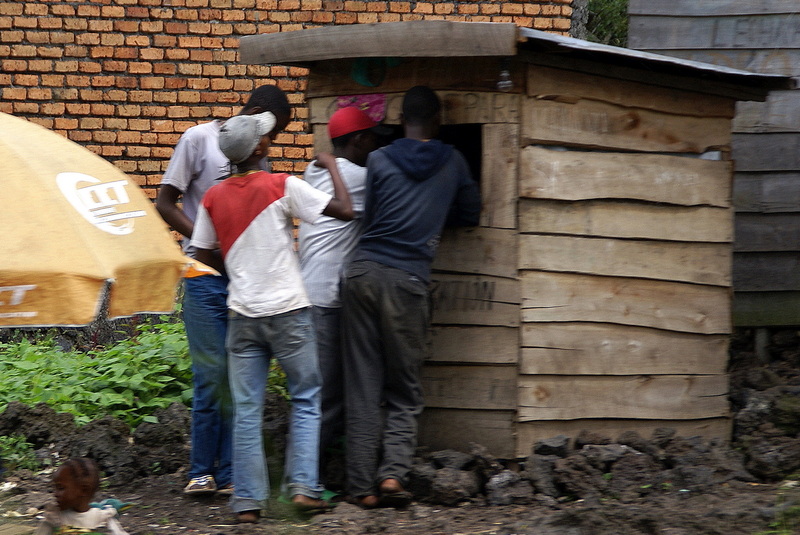 Forms were filled in, queues were stood in (with plenty of queue-jumper attempts), various bureaucratic huffings and puffings ensued at both border posts, and – to our complete surprise, and contrary to all the warnings we’d been given – no bribe nor even hassle occurred on the Congo side. Instead, after plenty of manual transcription of every conceivable detail into a large ledger book had recorded our entry (and US$35 visa fee), we each received an A4-sided visa form, like a merit award, and off we went. The hotel, Hotel Ihusi, is perhaps the best hotel in Goma, and the lovely lakeside location, stiff room tariff ($90 single), and eye-watering $15 pizzas and $10 mini-burgers at the lakeside eatery definitely supported that claim. The rooms were fine, the food was edible, and the front desk staff were cheerfully surly – ask them a question (taxi? location of the tourism office? telephone number for a tour company?) and the disdain was palpable. Yes they speak French, but still, it’s not Paris right? That afternoon, while my companions decided to take a nap, I headed out of the (armed guarded) compound of the hotel to take a walk. Turning into the long avenue that runs up from the lake to the town centre, the first of a few things quickly became apparent: this town had been hit by a natural disaster (the volcanic eruption of 2002, in which few people died but 40% of the town was knocked over by a slow but unstoppable lava flow). The roads were a mess. As I got closer to the town centre (about a 2Km walk), signs of reconstruction and repair appeared everywhere. And the most commonly-used building material: blocks, chunks and fine gravel all made from lava. Lava is so widely used that many of the buildings and almost all of the walls around those buildings are coloured a dull black-grey. Large areas of infrastructure work are also evident – ditches here, there, everywhere, for laying pipes and cables. All of this makes being a pedestrian a matter of keeping sharp and watching your footing as sidewalks suddenly run out and trucks, buses, mutatus, motorbikes, large wooden scooters used to haul goods, and UN and NGO vehicles all whizz by. The UN and NGO presence is evident everywhere. 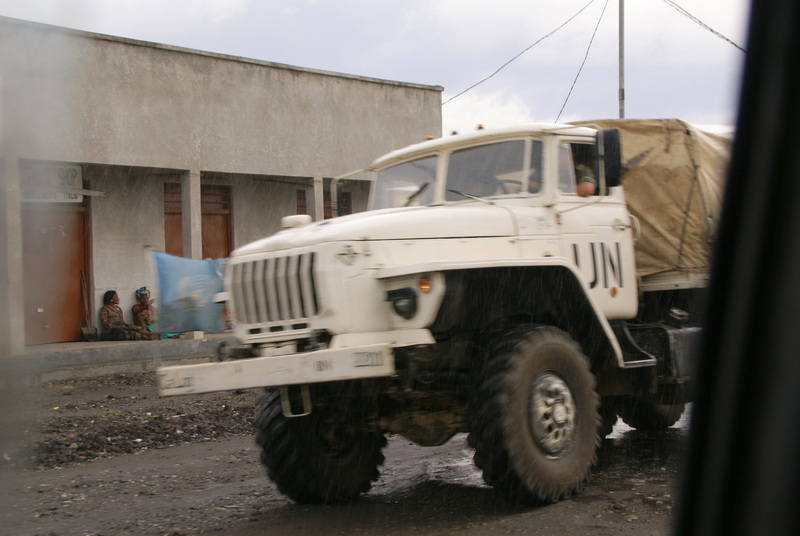 Armed UN patrols, by appearance mostly Indian and Middle Eastern soldiers, are ubiquitous. Equally as common as flies at a BBQ are NGOs of every type; Goma hosts over 200 NGOs, and, as I saw a couple of days later as we drove along the lakeshore dominated by large 2 and 3 story houses occupied almost exclusively by NGO families, they look after themselves well. I’d bet that these sorts of prices are a little out of the league of the university students we saw hanging out on the long, rusty balconies of their lake-side campus building. At dinner on one of the nights, we spotted a group of UN types at another table and fearlessly dispatched a (female) member of our team to reel one of these guys over to our table for a conversation, not least because one of our group is a young journalist who wanted the inside story. Within 5 minutes we had our UN man at the table, an affable young chap who, it turned out, is Jordanian. 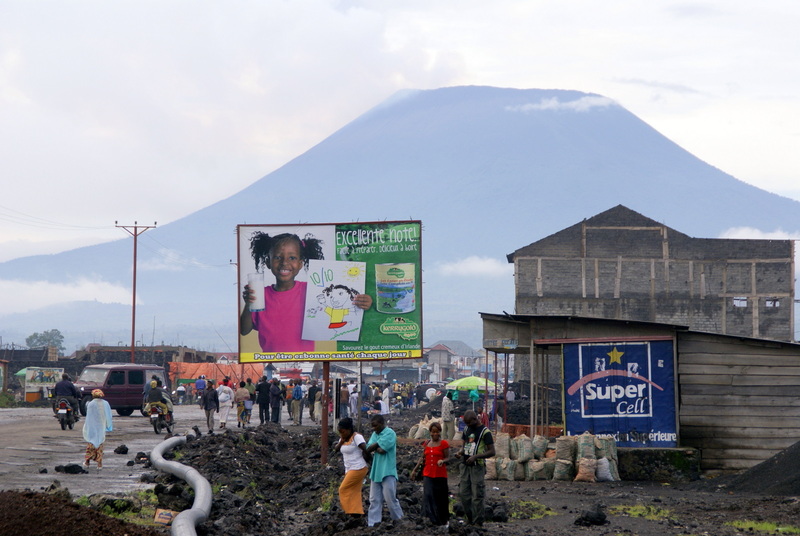 We quizzed him on his background, his role, whether his work could help rebuild the city, his interest in the politics of the place, and his reasons for being here in Goma. We never did get to take that boat ride down Lake Kivu. We had decided to take a two day trek, the logistics got fouled up by the agent which delayed us. 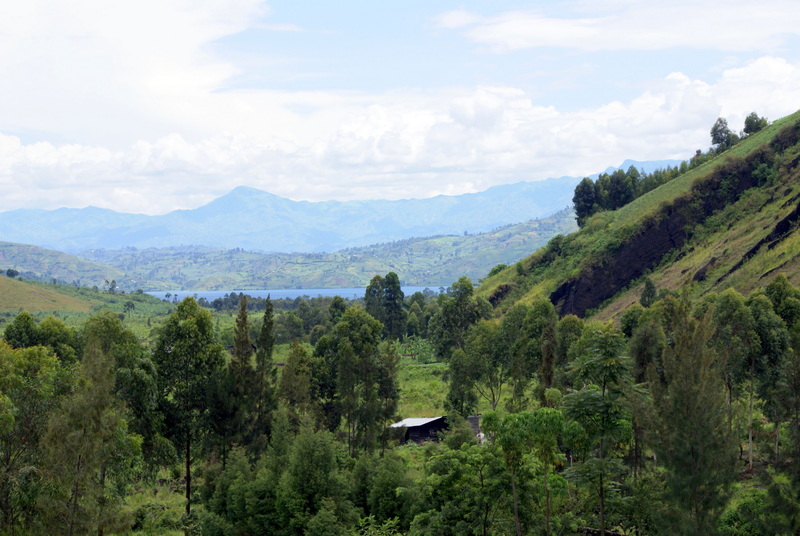 So we instead spent an extra day in and around Goma, visiting the lava field area and Green Lake (which is fed underground, separately from Kivu). We ended by cruising the long lakeshore drive where the sun shone on high-pitched NGO house roofs and gleamed on NGO 4WD SUVs storming in and out of razor-wired house compounds. I guess Lake Kivu, and its gas bubble, will just have to wait for another $5 bus ride from Kigali. “Kigali In Kenya?” On Foot in Nairobi. My sense of African geography isn’t great, but I didn’t need to phone a friend to know that something looked a tad odd. It wasn’t just the traffic – a lot of it, colourful, snorting, wheezing diesel fumes in every direction. It wasn’t the fact that there were actually street signs, with street names on them, not just on the major arteries but even on the downtown side streets. It wasn’t even the fact that I had not had to say ‘bonjour’ in a couple of hours of walking about cheerfully aimlessly. 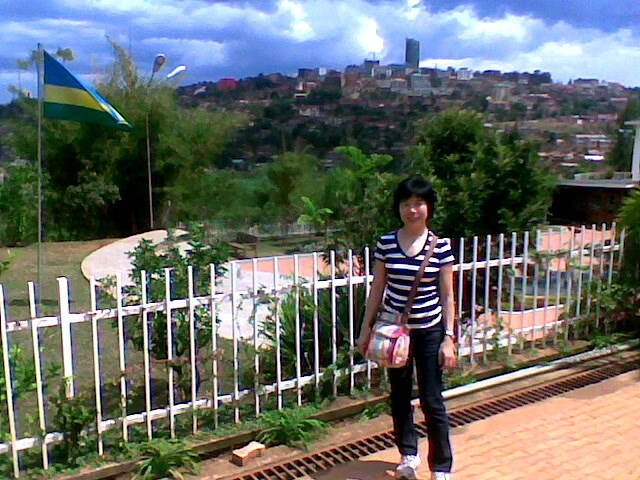 It was the fact that I was staring at a sign for Kigali, and there wasn’t a hill in sight. Flat as a cheap pizza. Not a one-thousandth of a hill to be seen. Or even tripped over. My sense of African history isn’t great either. But despite Rwanda proudly being the most recent addition to that bastion of annual party-going, the British Commonwealth, I don’t think there was a lot of Brit colonisation going on in Rwanda a century or two ago. So the cricket ground, anglo-style heraldic shields bedecked with prancing lions and prevalence of well-spoken English were a bit of a giveaway that this was indeed Kenya and no, apart from Kenyan goods in Kigali supermarkets and Kenyan managers in some Kigali companies, there wasn’t that much of a shared history. 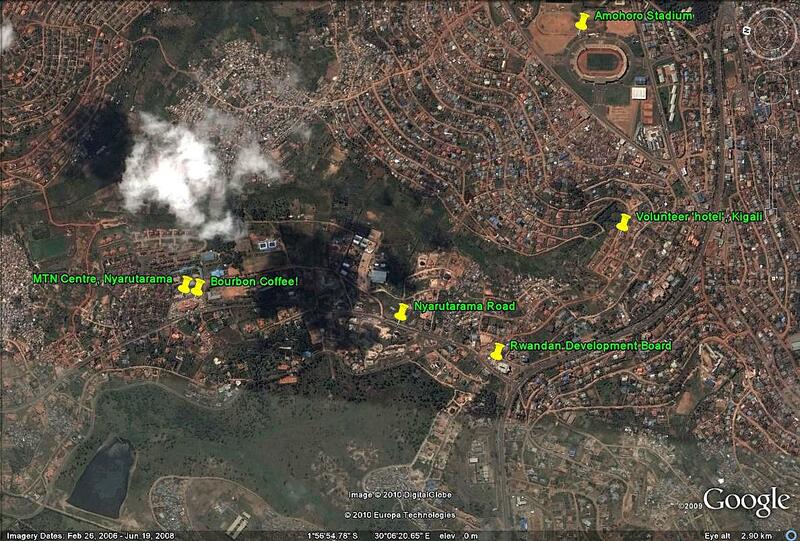 So Kigali in Kenya? Diligently I asked why, a few times (usually in ordering a beer) over the following few days, but no-one could (or would – the bar was pretty busy after all) tell me where the name came from. 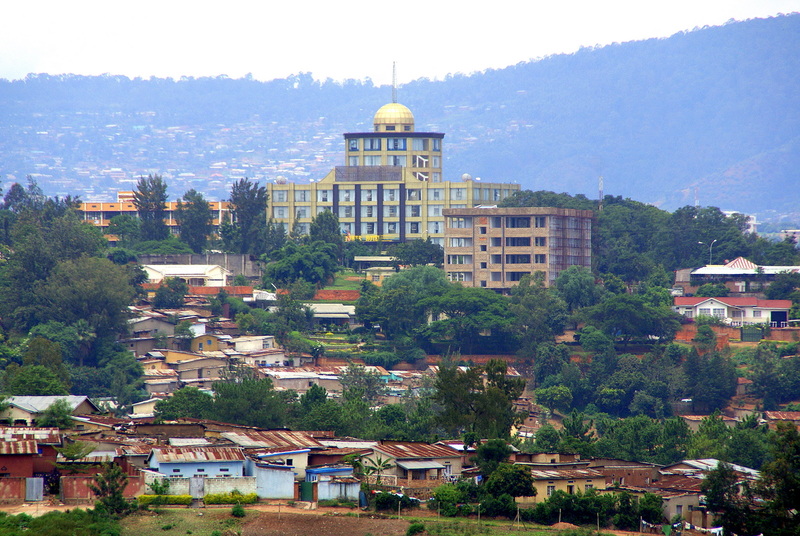 So all I know is that, close to the heart of this mile-high, thriving, thrumming, thirst-inducing thoroughfare for throbbing throatily thunderous diesels, home to around 3.5 million people living in a sprawling city around half the land area of that familiar sprawl called Sydney, is….Kigali. 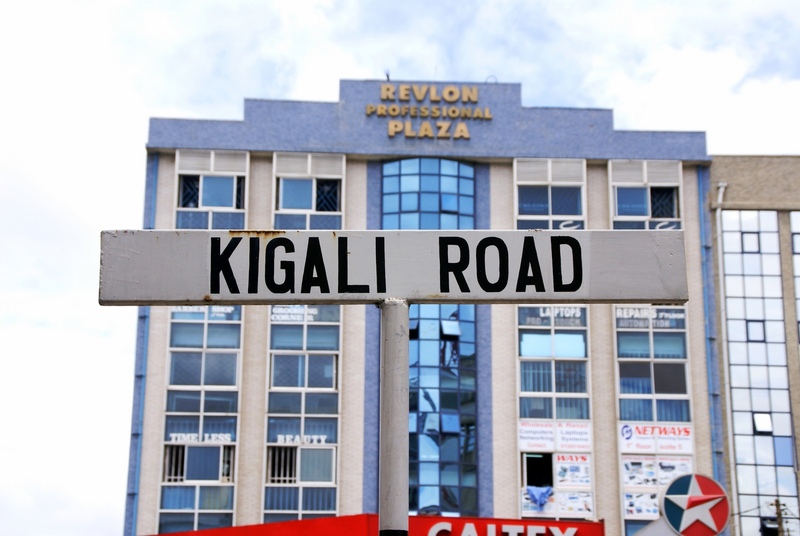 Kigali Road, to be sure, but still: Kigali? And no poky little side-street either, no snooty put-down by a big bullying John Bull neighbour to a small inoffensive pince-nezed gallic one. (I looked: no external elevator, to give the well-heeled penthouse crew a glimpse of their real estate, or give tourists an expensive ride to the top; and no bungy jumping either, most likely because it was, after all, completely vertical which would somewhat cramp jumpers’ styles…). 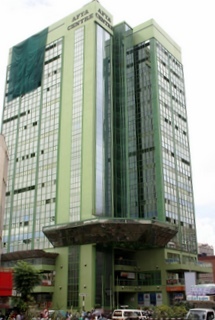 This is the Nation Centre, a whole 17 storeys high or approx. 70 metres, I guess times two. 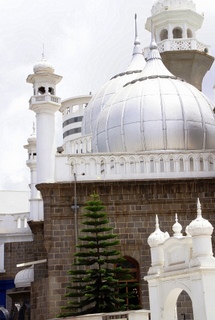 Along Kigali Road, opposite a scrabble of shops and arcades, is the Jaima Mosque. It is big, occupying a city block it seemed. 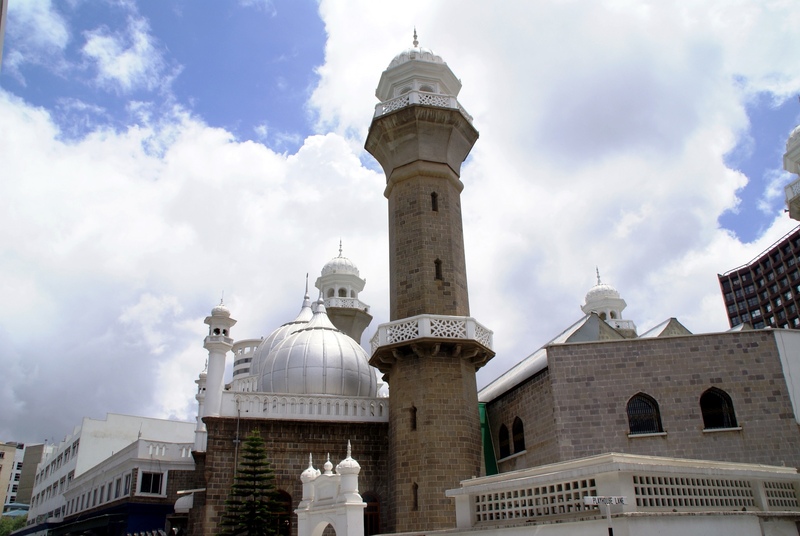 According to at least one Islamic website in Nairobi, the mosque can hold up to 12,000 worshippers at once. 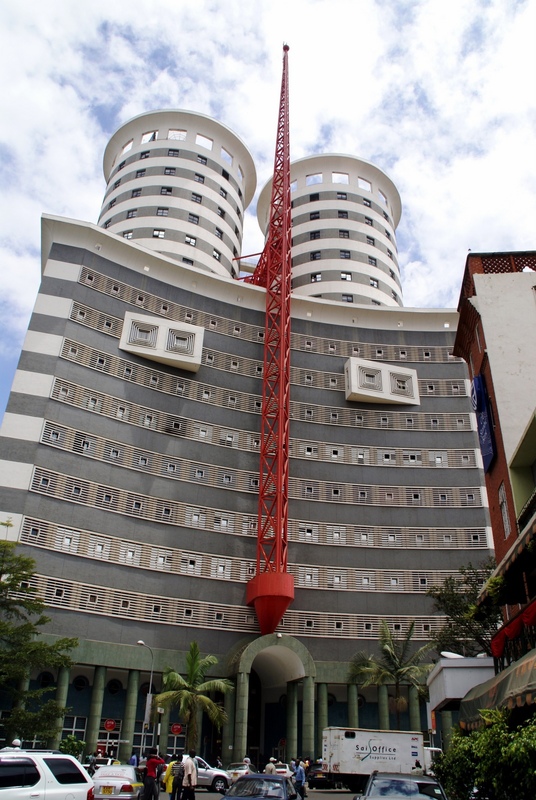 There are a number of other lovely buildings in and around Nairobi downtown. It struck me that there were some similarities to cities like KL and Bangkok in Asia, and sure enough, the wisdom of the crowds that comprise the Wikipedia writers and editors agreed. According to Wikipedia: “A feature of the central business district that strikes foreign tourists the most is the Skyline. Nairobi’s skyline has been compared to many Asian and American cities. 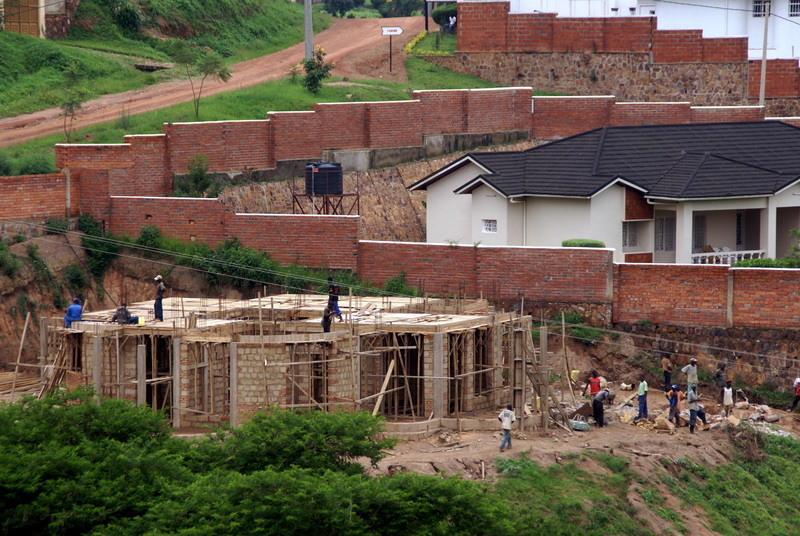 This is due to a construction boom after independence, and another construction boom in the late 1990s and early 2000s. Wiki continues: The United States Embassy bombing took place in this district, prompting a new embassy building to be built in the suburbs. 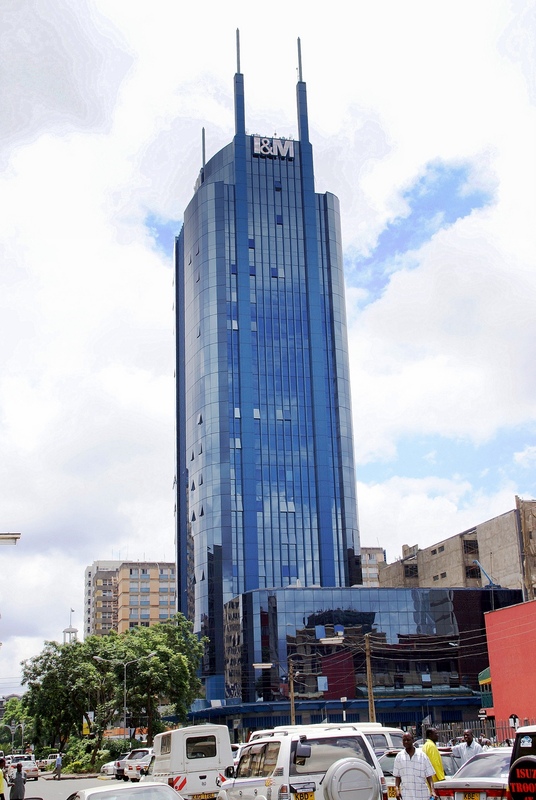 Most of the skyscrapers in this region are the headquarters of businesses and corporations, such as I&M and the Kenyatta International Conference Centre. 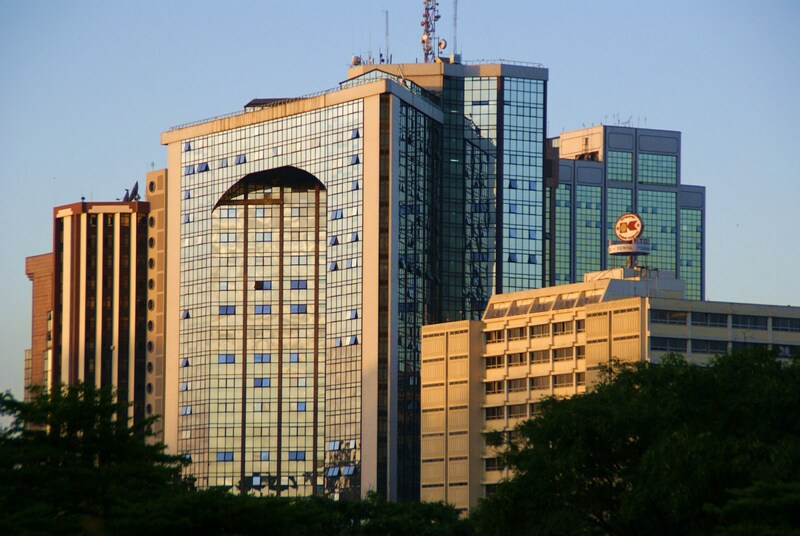 In 2006, a large beautification project took place in the CBD, as the city prepared to host the 2006 Afri-Cities summit. 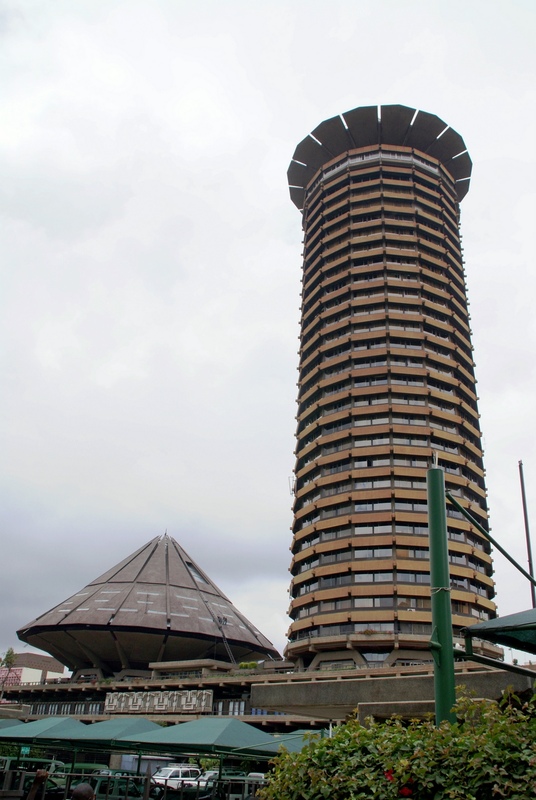 Iconic buildings such as the Kenyatta International Conference Centre had their exteriors cleaned and repainted. The I&M Tower stands a dazzlingly blue 99 metres high. The glass curtained View Park & Hazina Towers glow in the late afternoon sun, facing out over a great park serenely in the direction of the Serena Hotel which nestles in amongst a lovely set of mature trees. …And the 1974 Kenyatta International Conference Centre, all 105 metre cigar of it, is just…big ! 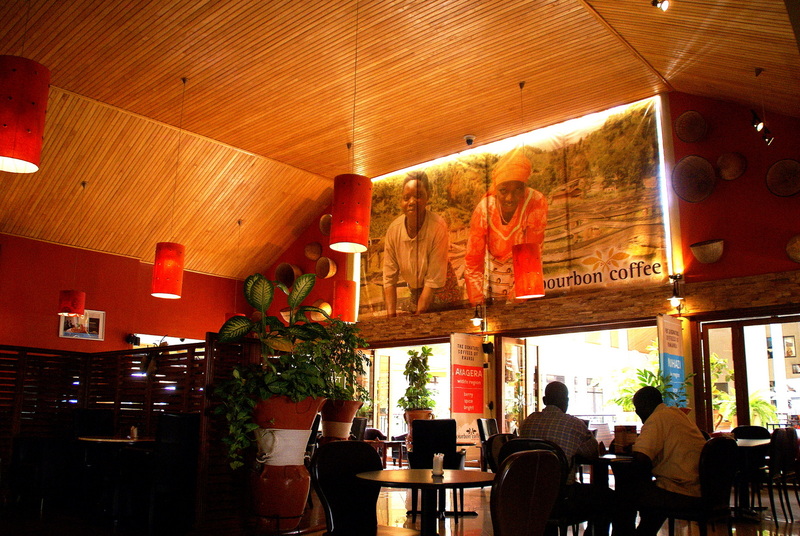 And when the day is over, and down-town has done all it can to extract shillings from your pocket in eateries and drinkeries, there is the rest of Nairobi to explore. Nairobi is not a major tourist destination, but it does have some additional attractions to keep you amused for a couple of days. The most emblematic is the Nairobi National Park, the only game-reserve of real size to have a city-scape as its photo-opp backdrop. Real animals live here in their natural domain – zebra, lions, giraffes, and hundreds of bird species – and there are both drive-around and walking safari visits available. Nearby to the Nairobi National Park are a couple of related attractions: the David Sheldrick Elephant Orphanage is inside the Park itself, while just a short ride by taxi away is the Giraffe Centre, about which I have written a blog note previously. All this is a welcome break from the down-town only a few kilometres away. 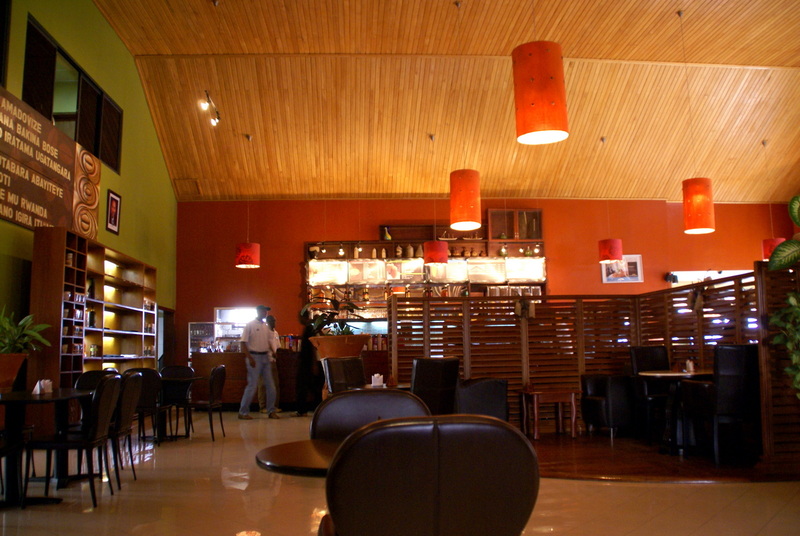 One of the quiet joys of a Saturday morning in Kigali is to go for a stroll to the coffee shop. Stepping out of the front gate (having woken the guard from an early morning kip), the open road invites. When it has rained, it is a little less inviting, because it is constructed from a sticky clay and rubble. 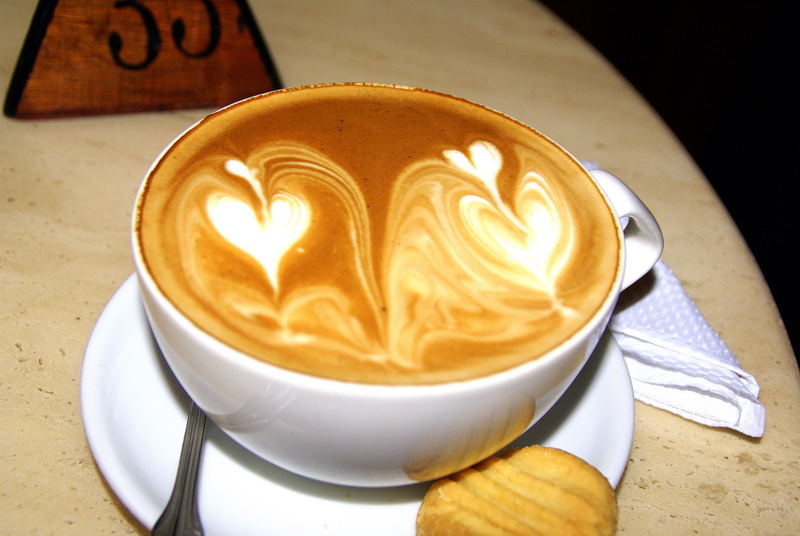 When it is the rainy season, it is sometimes wet and slippery, and all times rutted and bumpy. ...at the corner of our street. From the corner of our (unnamed) street, where it dog-legs up a small rise to intersect with another (unnamed) street, there is a little valley across which, on the next rise, there is a cluster of mudbrick houses, a couple of ‘boutique’ hotels, and some of the modern private housing activity that seems to be rapidly advancing over all the hills here. A big old dump truck is dumping a big old load of rubble on the side of the road. This can only mean…roadworks. And so it does; just around the bend, and one section of notoriously nasty ruts is plugged, loosely, with a dump of rubble. 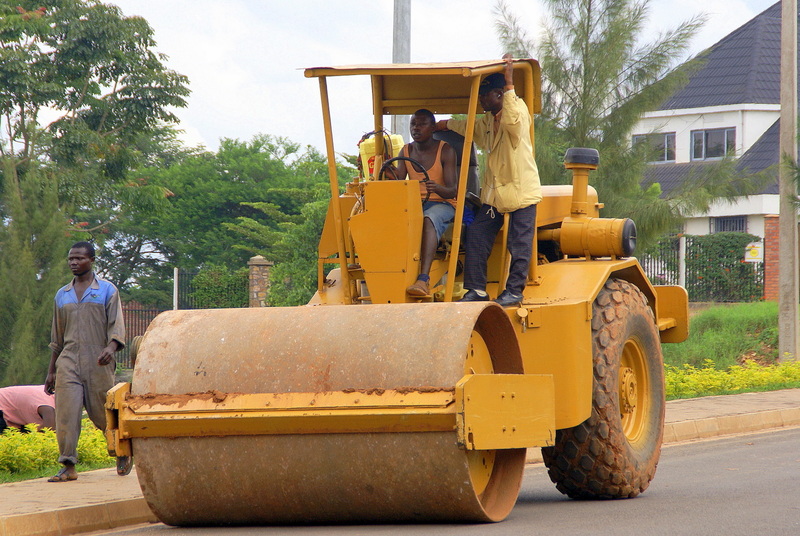 There won’t be any smoothing it down – that only happens in the nice neighbourhoods, where asphalt roads are laid and big drainage ditches are dug and lined with retaining walls. 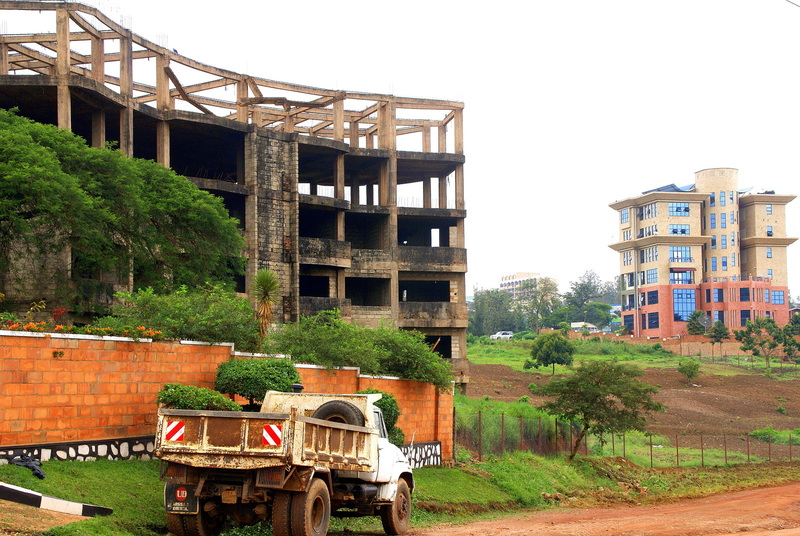 This happened up at the far end of the road much traveled I am taking now; big office buildings sit up there, adjacent to the major thoroughfare of Nyarutarama Road… the sealed road runs past these office buildings for about 30 metres and then just stops. 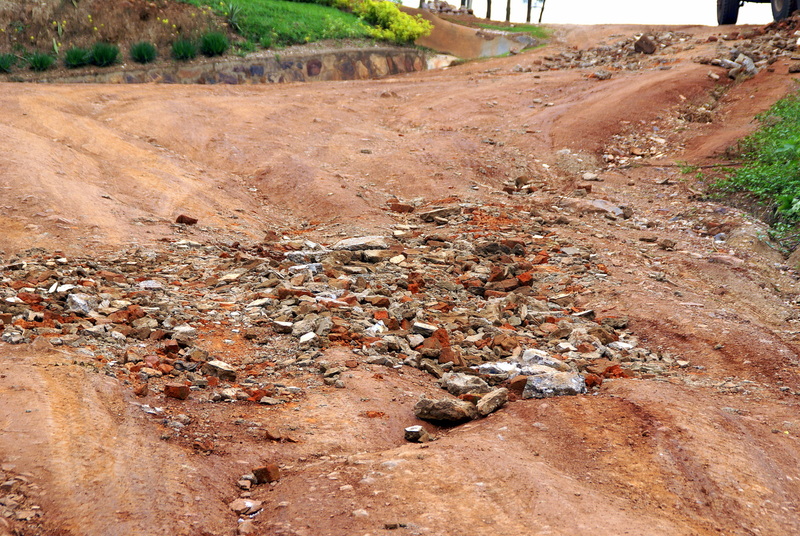 Here, the idea is that passing vehicles, at some risk to their suspensions and mufflers, will pick their way gingerly over the strewn rubble and eventually tamp it down. A form of community involvement I guess, not just limited to the monthly Umuganda community work day on the last Saturday of each month. 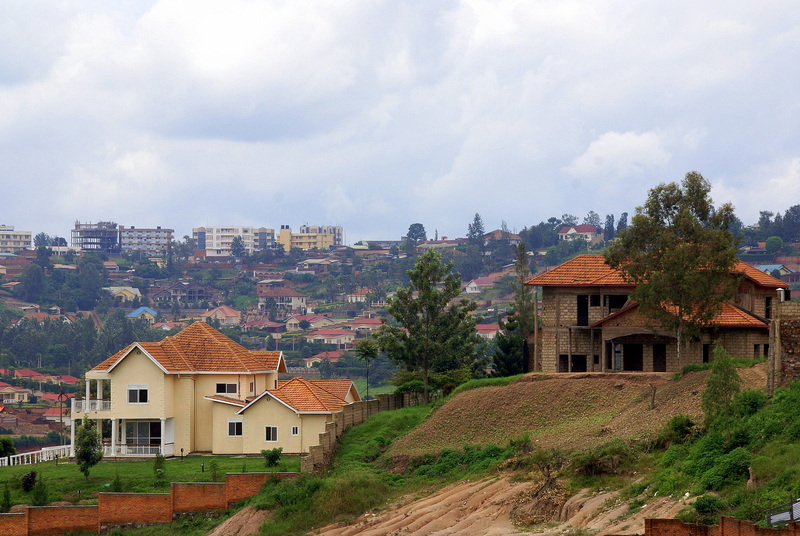 The contrast of buildings dotting the hillsides is visually interesting; ambitious ruins from the pre-war era standing beside simple houses being torn down to make way for large office buildings (but not residential – one of the big contrasts with Singapore who in so many other ways is a bit of a role model for Rwanda). 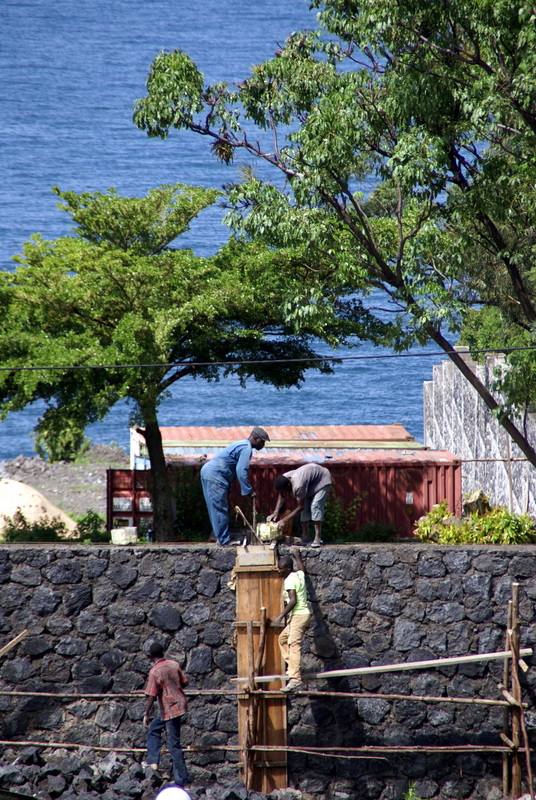 And everywhere, people – cultivating a block of land here, tilling a small plot between construction sites there. 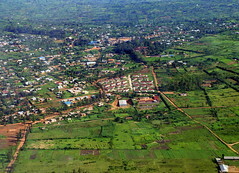 Down in the shallow valley between Remera-Kimironko (as one ridgeline) and Nyarutarama (as another ridgeline), no large houses are being built – only the poor live at the boggy, soggy foot of the hills. These valley fields are laid out and are worked similarly to the rest of the country. 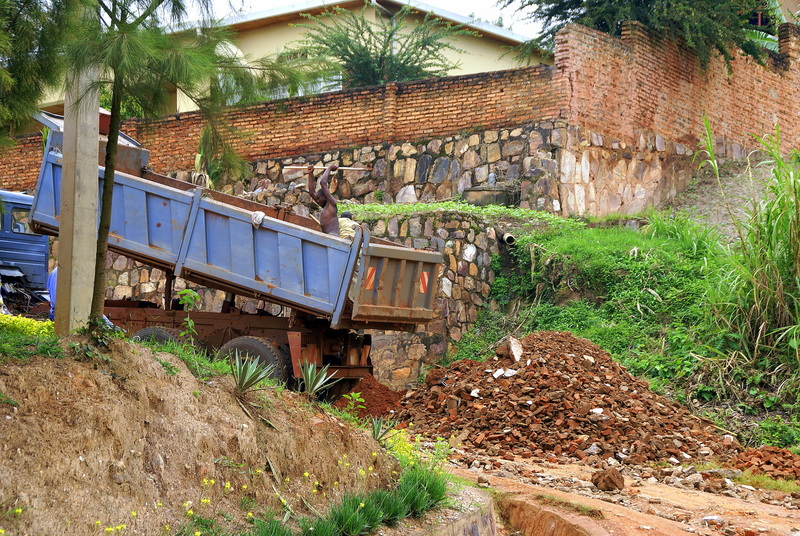 In Kigali city, as soon as you step away from a major road and go beyond the mansions, you are likely to see a cow in a rickety stall or a tethered goat at any moment. 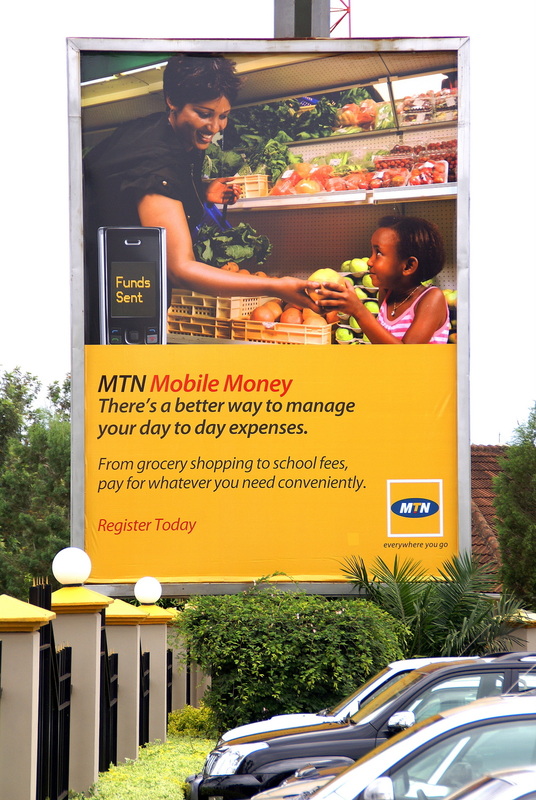 At Nyarutarama Road, things start to bustle. 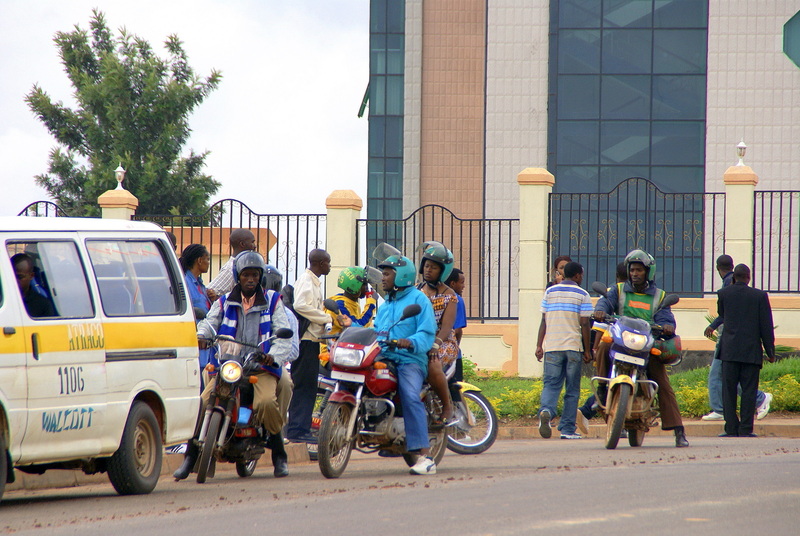 Right by the imposing Rwanda Development Board building is a busy mutato (mini-bus) and moto (motorbike taxi) stop. People crowd around buses peering in and gauging the relative comfort of the remaining seats, while young guys with bags of nuts and with trays of hard boiled eggs work the crowds or hop the buses themselves to go find another selling spot. All the while the bus ticket seller/tout is shouting out destinations to fill that one remaining seat before he will let the groaning bus go. 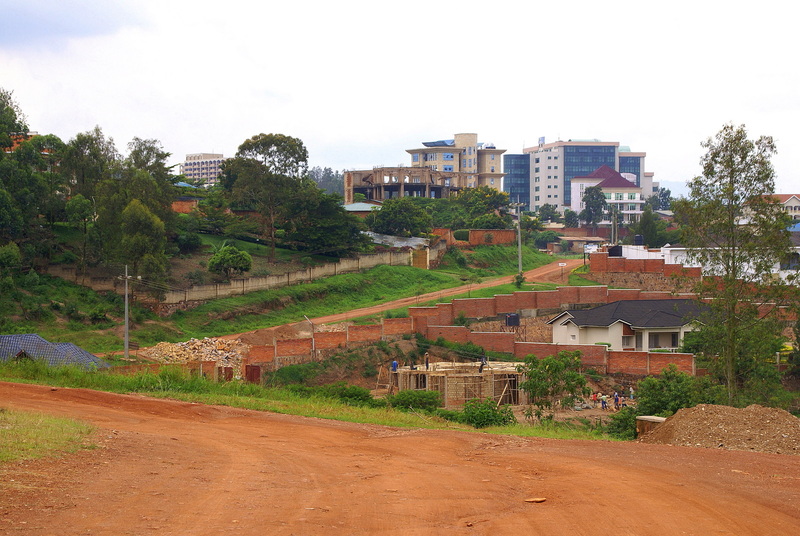 Nyarutarama Road is upmarket and it shows; the sidewalks are paved, the nicely laid-out gardens alongside the road have retaining walls and deep drainage, and the road itself is wide, allowing impatient SUV drivers to go whizzing down the wrong side of the street for hundreds of metres so that they can avoid being delayed in being first to get to the traffic lights or speed bumps that stop traffic anyway. Some days this all becomes “NGO carshow” time; fleets of 4WD cars and double-cab light trucks roar up and down the road, NGO logos emblazoned on doors and with earnest-looking drivers and passengers… But not on Saturday; even in the late morning, the road is quiet and only the occasional car or clearly ‘company vehicle’ rolls along to compete with the buzzing motos. 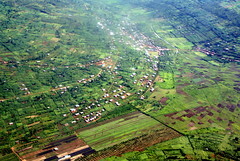 Nyarutarama Road runs along a narrow ridge. As a result, to left and right you have often uninterrupted views of middle-distant companion hills, along which traffic runs and houses cling. 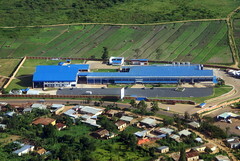 Nyarutarama is swank, and that accounts for why several embassies and high commissions are housed here –Tanzania and Uganda are the first encountered. On a Sunday an added attraction is the singing that bursts out from the churches that sit down the hill a little; one, a massive simple construction, is very busy on Sundays, and another – where services take place in a huge marquis tent due to ongoing construction of a big structure – seems even more crowded and even louder. And everywhere, there are those large houses. The MTN Centre is a big looming construction; and clearly there are clearly some running repairs needed before the next rainstorm comes. No safety harnesses in sight. Through the busy car park and into a very modern mall. And past the guard with the shotgun. 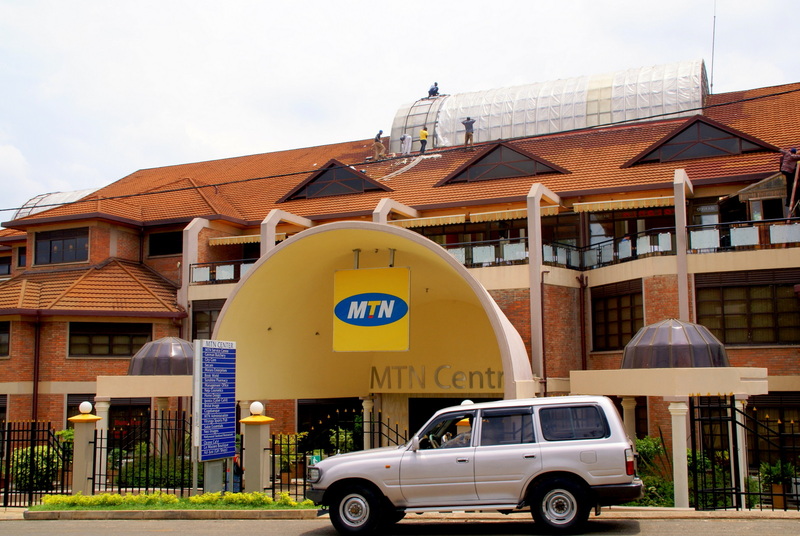 The MTN Centre has, naturally, a large MTN outlet with service desks for pre-paid airtime purchases, post-paid account, internet subscriptions and a very small selection of handsets for sale. It is open long hours during the day, and always well guarded. The MTN Centre also has: a decently-stocked pharmacy; a rather unexciting French-English bookshop (Ikerezi in town is much better); the ‘German Butcher’ deli which offers a good selection of meats, breads, a modest range of foreign grocery items and a pretty awful selection of over-priced fruit and vegetables. MTN Centre also has a good hairdressers (male and female, Mzungu no problem as a dreadlocked Kenyan named Evans does a great job without talking you to death); and, alongside two sports-bars, one of which does a big trade in buffet lunches, I find Bourbon Coffee, the flagship of Rwandan consumer exports, with their store now open on L Street in Washington DC, in addition to the three Kigali stores. 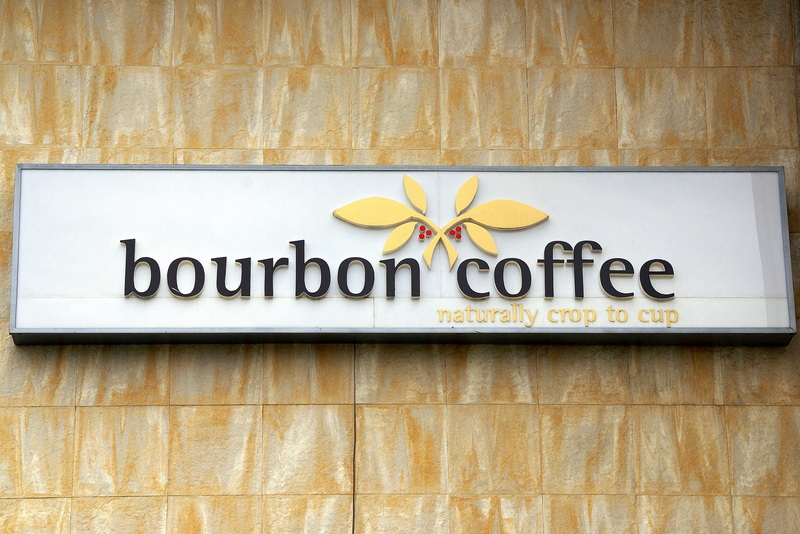 Bourbon Coffee is just what I want on a Saturday morning; it is (relatively) quiet, it is large and spacious, with leather armchairs, lots of well-spaced tables both inside and three outside on a small deck; it has plenty of power outlets for the digital nomads to feed their laptops while they feed on a wide menu of western styled foods (hamburgers, baguettes, samosas, salads, you-name-it…and a big selection of cakes and ice creams). And – when it is working – free WiFi (password controlled). Kenya and much of East Africa are almost synonymous with ‘Nyama Choma’ – the charcoal-roasted succulent meats, cooked (nowadays with added spices and lemon) for ages so that the juices infuse the meat… ‘Nyama Choma’ in Swahili means roasted red meats cooked slowly over charcoal. It originated over 1000 years ago with the Maasai tribe. 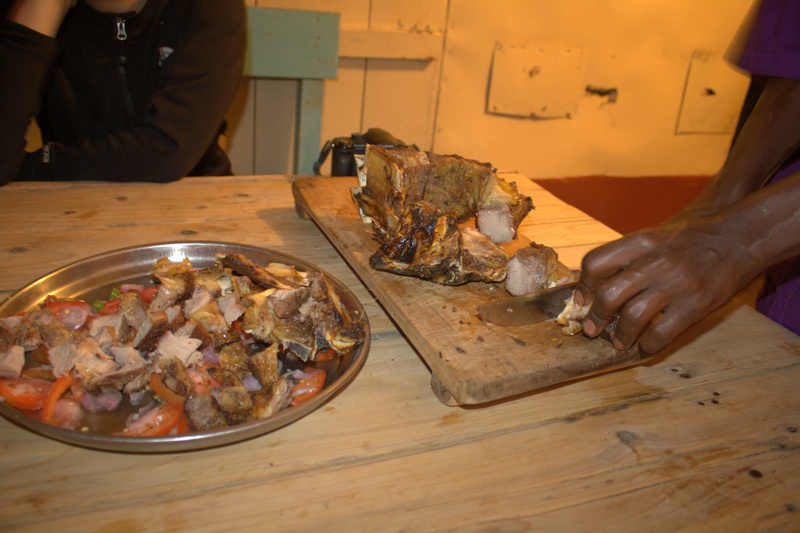 The most popular ‘choma’ meat is the grilled flesh or spareribs of cows and goats. 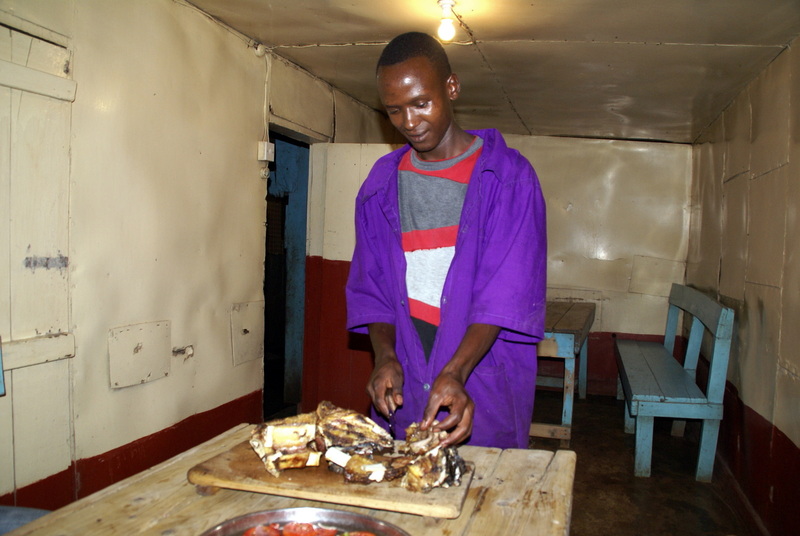 Until recently modern Nyama Choma also meant, for a price, wildlife meats – ostrich, giraffe, crocodile and zebra. But apparently that has been stopped – certainly all we saw in traveling up & down the south-west of the country was goat, beef and chicken choma. 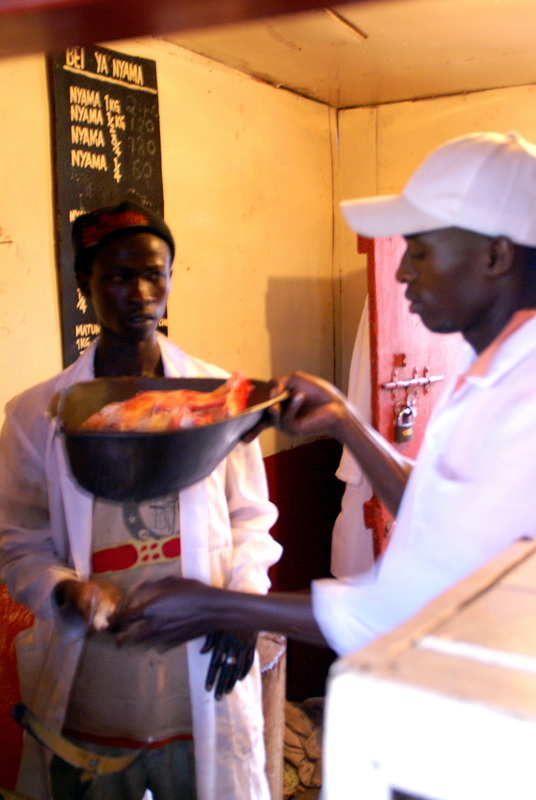 Eating in Africa is always part performance art. 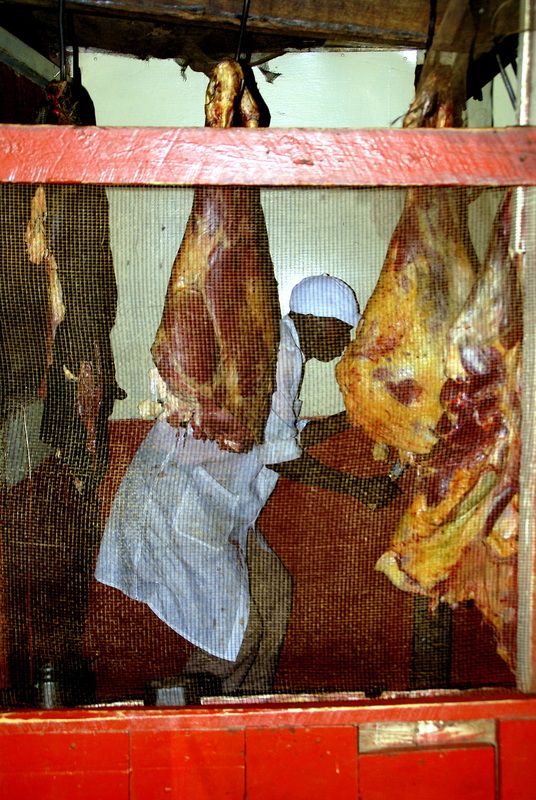 With Nyama Choma, you start by crowding around a window/counter and peering at the carcasses hanging on big hooks within a wire (or if a really fancy place, glass) cage. Flies buzz, a lusty whiff of meaty/bloodiness fills your nostrils, and the carnivore in you says: eat! Fighting your way through the jostling clientele, you get to the kitchen window and order by weight (half a kilo per person is plenty), direct from the butcher’s hook or out from the fridge. There’s usually a choice of goat, beef, mutton and chicken. You inspect the slab of sliced ribs, nod, and the order is placed. Seated at typically rough-hewn long tables, medieval-style, the steaming meat is brought to your table on a wooden platter and in moments it is chopped to bite-size with a sharp knife. Then it is every eater for her/himself… fingers grab at cubes of meat, bones and fat are deposited on the table, a greasy 15 minutes of eating takes place, usually accompanied by a dish of greens or of ugali, which is a maize porridge-like concoction which serves as the staple starch. The perfect end to this performance is surely another round of beers to make it a perfectly balanced meal. 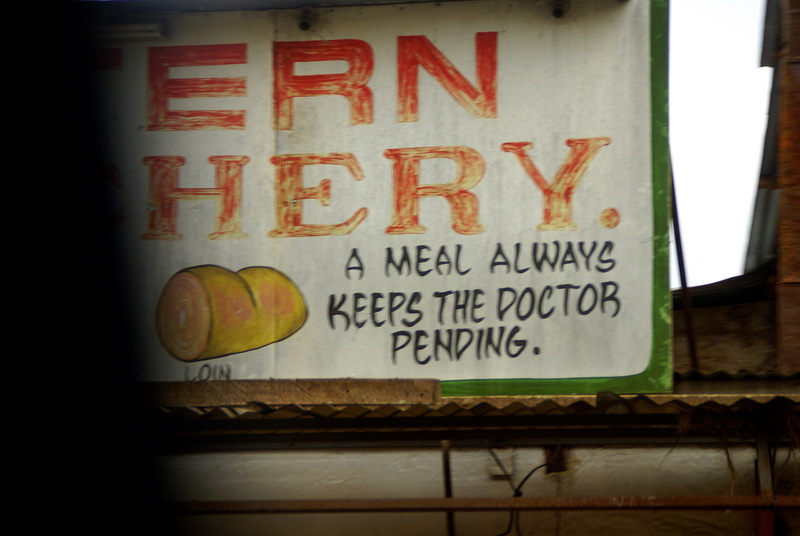 After all, one must always keep the doctor pending…. You don’t come to Nairobi to see Nairobi itself. The British built it 100 years ago as a rest-stop on a long train line to somewhere else; the city still reflects that. 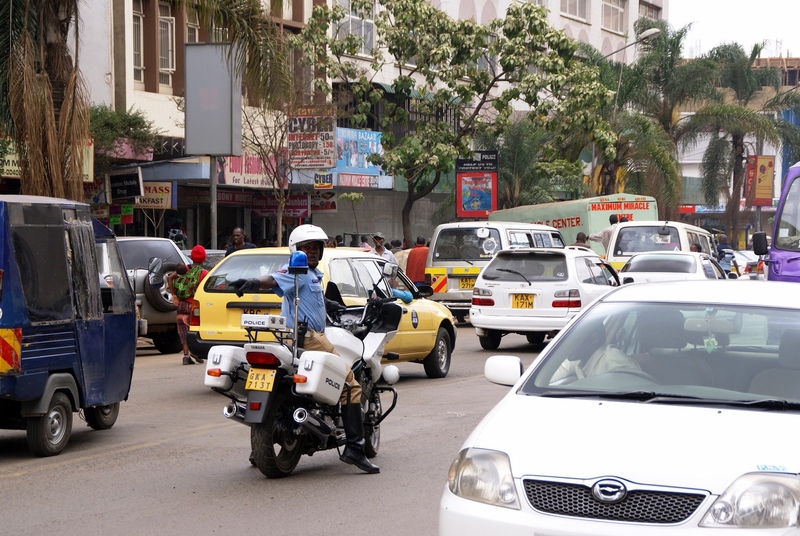 You come to Nairobi to use this bustling, fun, traffic-choked, aggressive city as a launching-off point for other things. Climbing Mt Kenya. Buying trinkets from Maasai. Safaris, safaris and more safaris. Diving near Mombasa. Nearer to ‘home’ – in fact, even on a lousy traffic day, barely an hour from Down Town, there are great attractions however. The Nairobi National Park. The Elephant Orphanage. 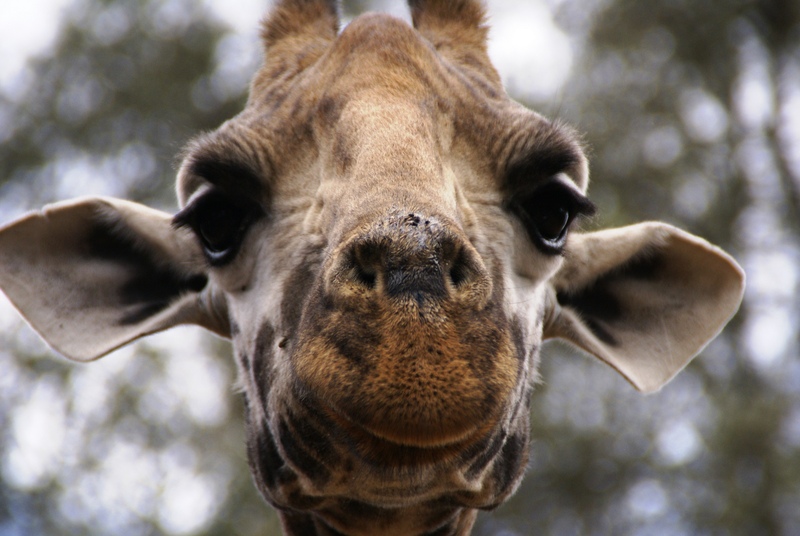 And – for those not afraid of heights – the Giraffe Centre, which specialises in rearing and showing the endangered Rothschild Giraffe. Here’s the Wikipedia blurb on the Giraffe Centre: “The Giraffe Centre is located at Langata, approximately 5 kilometres from the centre of Nairobi, Kenya. 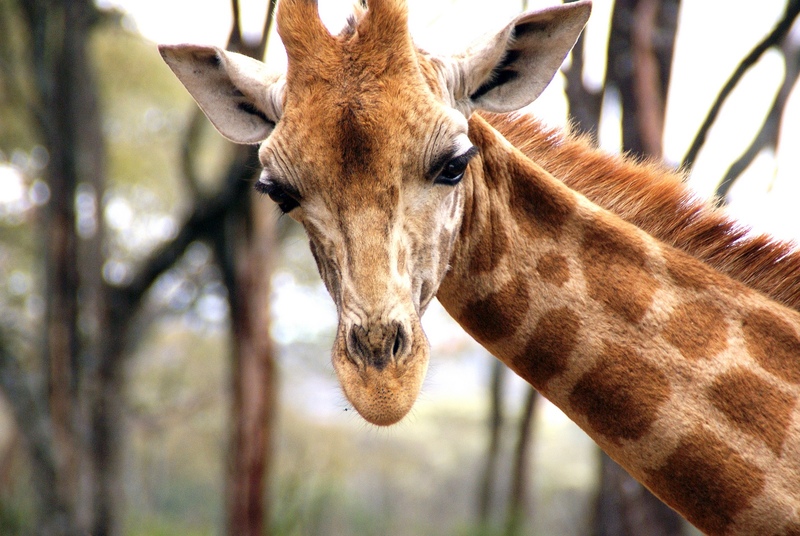 It was established in order to protect the endangered Rothschild giraffe, giraffa camelopardalis rothschildi, that is found only in the grasslands of East Africa. 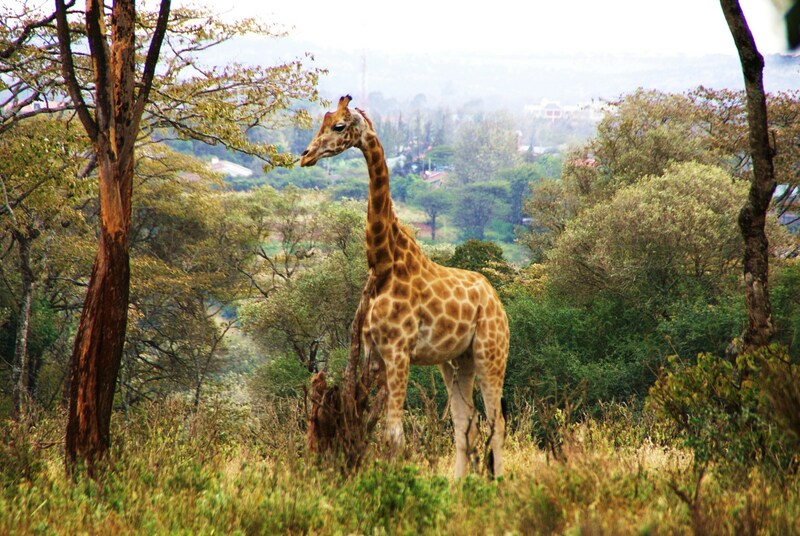 The Giraffe Centre was started by Jock Leslie-Melville, the Kenyan grandson of a Scottish Earl, when he and his wife Betty captured a baby giraffe to start a programme of breeding giraffe in captivity at their home in Langata – home of the present centre. 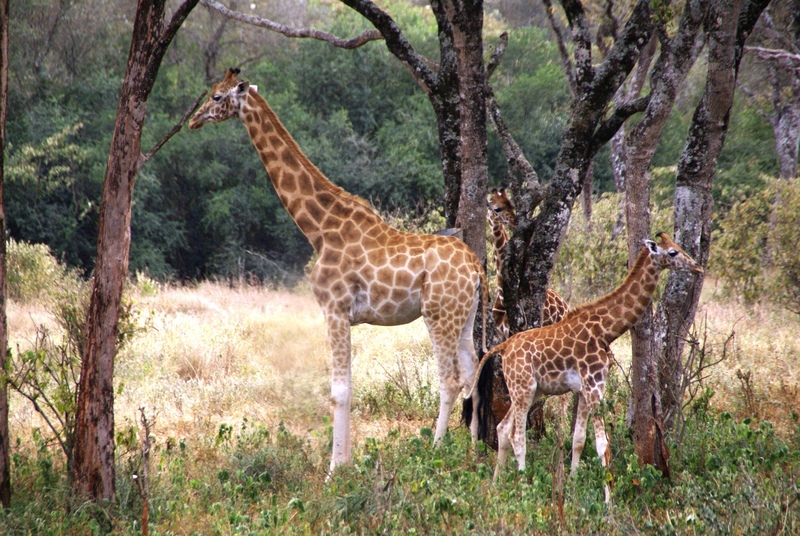 Since then the programme has had huge success, resulting in the introduction of several breeding pairs of Rothschild Giraffe into Kenyan national parks. Feed them you do; they come sailing along, on impossibly long knobbly-kneed legs, from way over along the tree-line of the park, steaming towards the viewing platform. When they’ve had enough nibbling – or need some de-stress time from the endless photo-snapping – they sail away, with the (very informative) attendants calling them back by name, rattling food pellets in the wooden trays, and clanking the metal bucket handles on the bucket rims. Sometimes it works; and sometimes the giraffe just turns that long, long neck back, bats a long, long set of eyelashes at the humans, and snorts. Giraffe factoids: in captivity these guys will live up towards 30 years, while in the wild the average age is barely double digits. The current group seemed to average around 17-18 years of age, with a few babies (and so cute: just a tiny wee 2 metres at birth, mere tiddlers!) in amongst the group. They are social yet fairly solitary it seemed to me: most adults hung out by themselves or in pairs along the tree line, often just standing still for long periods of time. Factoid: they require less than 30 minutes sleep a day. Factoid: a mummy giraffe carries her bub for about 15 months, but can delay birth by up to 3 months if conditions are not good. That, girls, is a long time! 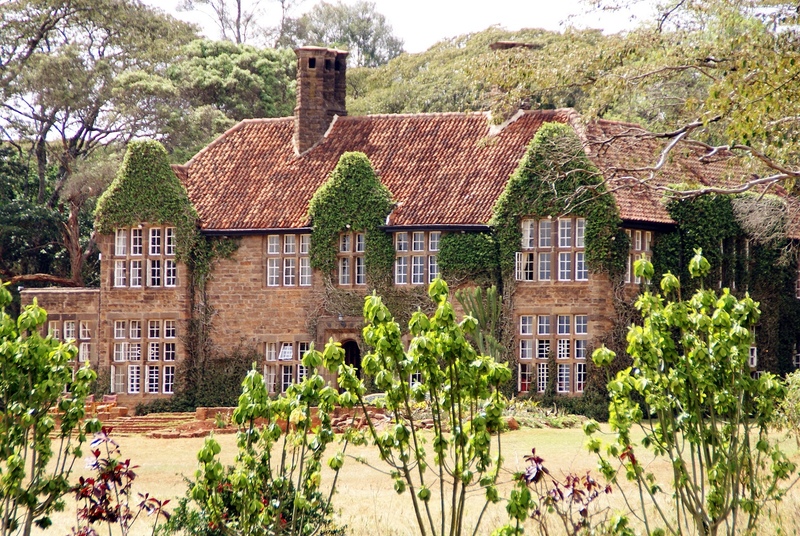 Off in the medium distance, the Giraffe Manor (built 1932, now a boutique hotel) stands elegantly with a large lawn out front, across which giraffes amble casually. 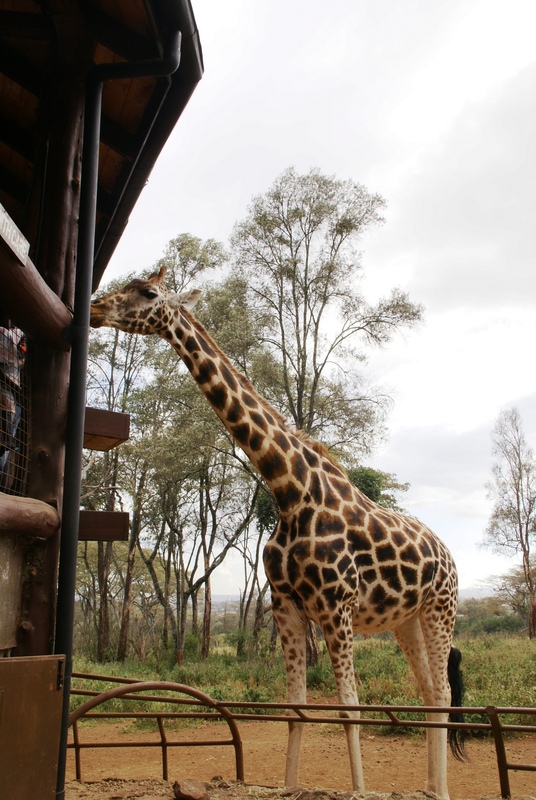 Guests apparently feed the giraffes from their second storey bedroom windows – a new take on room service. 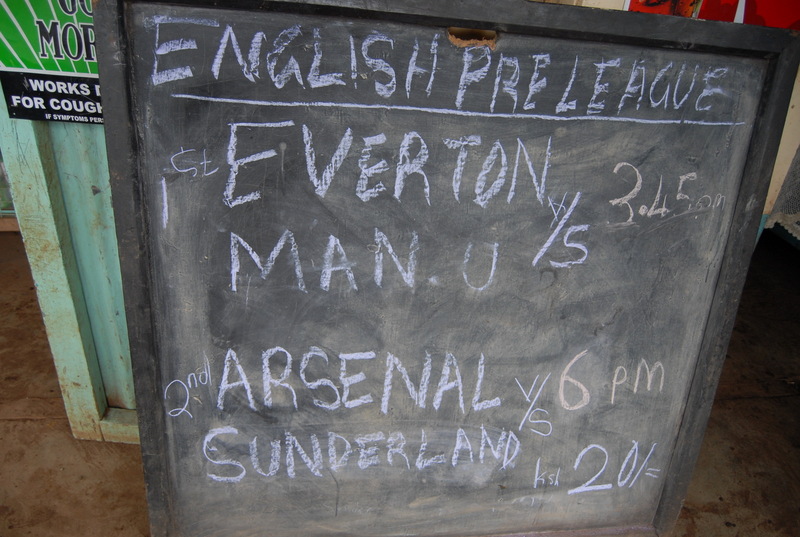 The current price of admission is Ksh700 (around US$9.70), and a cab ride from down-town is Ksh 800-1000. 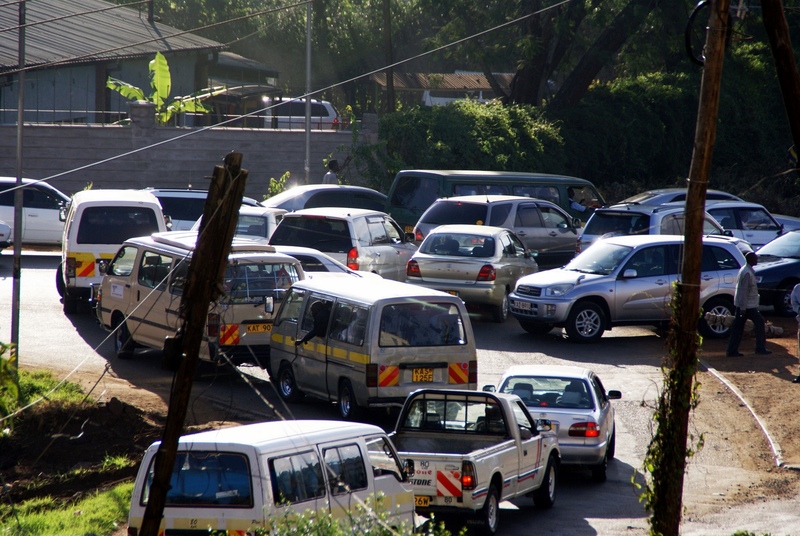 The drivers are then willing to wait a couple of hours, for no charge, to get the return fare back to lovely Nairobi. 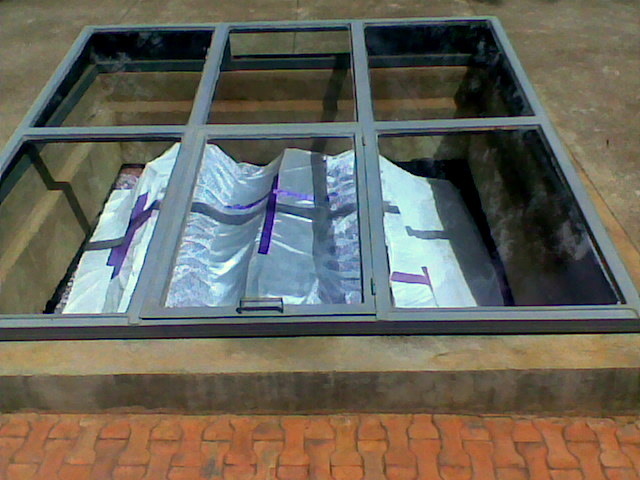 Yesterday was my third visit to the Kigali Genocide Memorial Centre since arriving in Rwanda. The first had been with Sorny, as newly-arrived residents in mid-September ‘09. Having read Kinzer’s ‘A Thousand Hills’ we had a reasonably good view of the history and the culpability of a wide range of players. The story is laid out chronologically, cleanly presented in long narrow hallways dimly lit so that you are drawn to the illuminated displays and videos. The narrative gives just enough detail to get a sense of how it all built into what seems an inevitability, but not an overload of information – there is enough “white space” that you have time to reflect a little between sections. There is a curious juxtaposition between the emotion all this generates – as you see a small nation heading towards the abyss – and the almost clinical narrative provided. The most moving area may be the children’s section, where large photos of children are presented on the walls with a snapshot of their family background, their age, their likes & dislikes (favourite food, favourite game), and then – how they were murdered. Criticism of the UN, US and of France is restrained; having read of the blunders and home-politics fixation of the former two, and the sheer cynicism of the French, Sorny and I found ourselves choking a little on how much was not said. The Memorial comprises a museum laid out in three parts – the precursor history of uncaring colonialism in Rwanda; the path to the 1994 genocide; and then zooms out into something very welcome: a global presentation on genocide, with case studies in some depth presented in text and photos – Cambodia, the Holocaust, Armenia… In the grounds outside, three large concrete-roofed vaults house the mass graves; apparently some 250,000 bodies from Kigali are interred there, most unidentified (as a long wall with only a couple of thousand names recording actual identifications attests). The Kigali Genocide Memorial contains oral testimonies collected from different Kigali city quarters, along with human bones and skulls that have been treated for conservation. 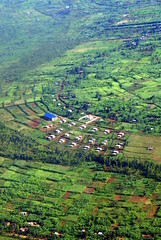 Accounts of personal tragedy and of personal heroism – by Tutsi but also by moderate Hutu, a crucial point emphasised by current-day government messaging – are given prominence. Weapons used during the genocide — clubs, the infamous machetes (or pangas), clubs, even swords — are also preserved there. 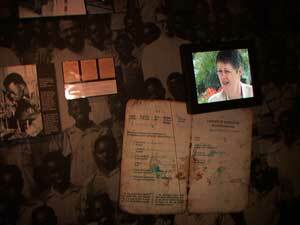 The Kigali Genocide Memorial also contains personal possessions such as photos, rosaries, identity cards, shoes, clothes – all abandoned by victims as they tried to flee. The almost-clichéd natural reaction is for people to murmer ‘never again’ as they survey the means of such cruelty; but the additional wing of the museum reminding us all of how often this does happen provides a salutary reminder that mere sentiment is not nearly enough. My second visit was accompanying a few newly-arrived colleagues. They were interested, they were moved, but they also took only half as long as Sorny and I did to have ‘been there, done that’ — then on to the next tourist stop. This third visit provided a more personal perspective. I had joined about 150 other people standing in the hot sun was to observe three white-shrouded coffins being placed into one of the mass grave vaults in the grounds of the Memorial. We were all there as part of the interment ceremony for the bodies of relatives of Benjamin, one of my colleagues at the project in Rwanda. 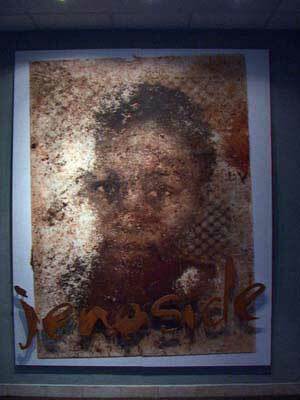 Their remains had only recently been discovered and identified – Benjamin’s father and two of Benjamin’s brothers. 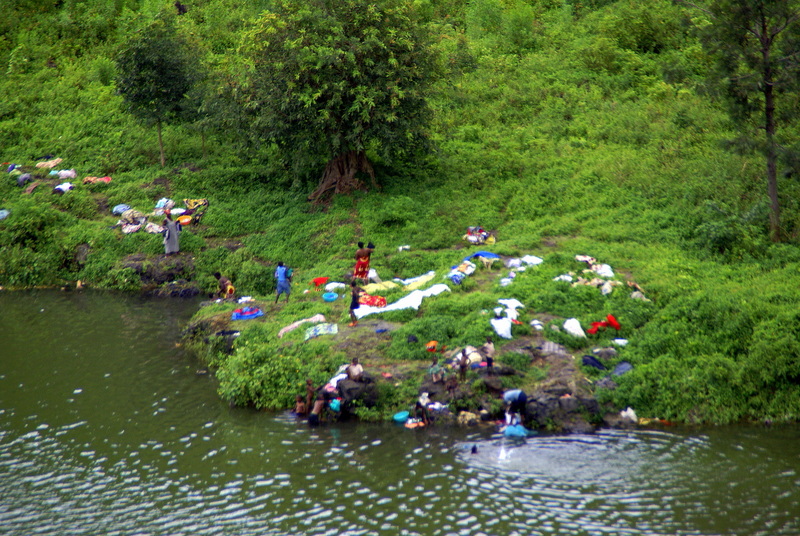 Several survivors were present – three siblings, and their mother. We heard, from the speech given by a neighbour at that time, that the Interahamwe had come searching for the father on 31 May 1994 in Kigali and, having failed to find him, killed two of his teenage sons. When the father heard this dreadful news, he wrote a letter asking the remaining sons to look after their mother and their youngest sibling – Benjamin – and then he gave himself up, to protect his remaining family. He was murdered on 2 June 1994. Then the bodies were dumped and lost for over 15 years. 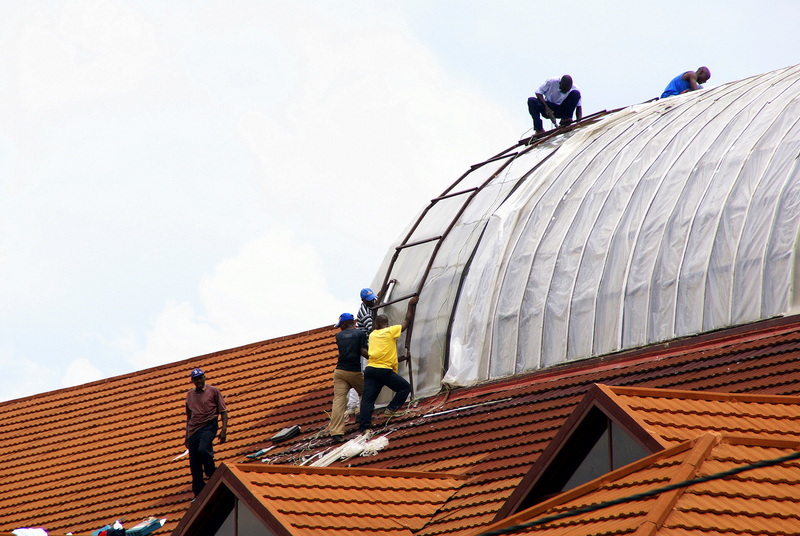 Preceding the burial, we had attended a funeral mass at the large, airy cathedral in downtown Kigali. 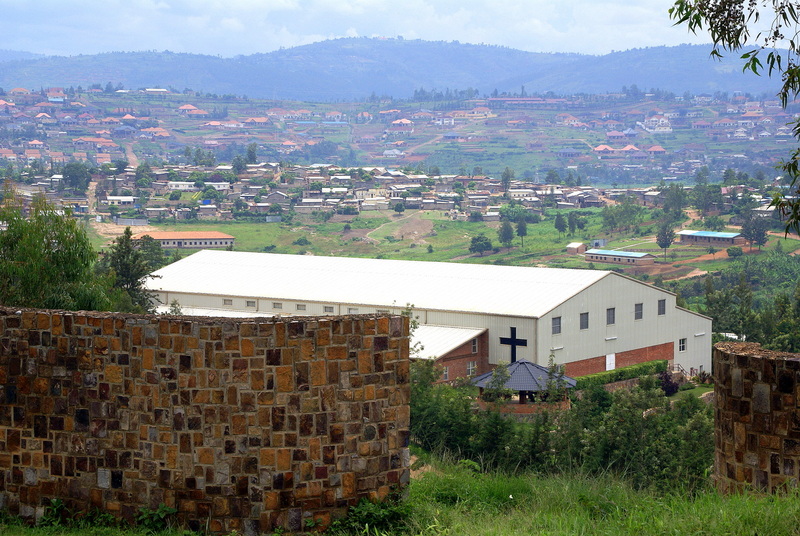 White and purple are the colours of mourning in Rwanda; the female family members were dressed in lacy white mourning clothes, while the sons wore dark suits, white shirts and red ties. While the ceremony was all in Kinyarwanda, the pattern of the rituals brought back memories from my childhood; catholic myths and customs go deep! The one difference was how spirited the singing was of some of the hymns, with clapping to the beat in a couple of them. Not a bad send-off to bring closure to yet another personal-level tragedy, in a town which saw so many 16 years ago. Welcome to my wanderings far from home. This blog is a way for me to try to share some of the sights and daily adventures of living in Rwanda and neighbouring countries. I will post some photos and videos along the way...bandwidth-willing...! 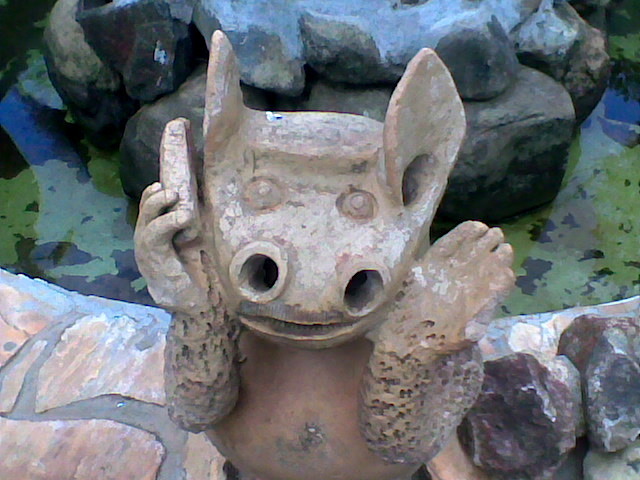 If you like animal photos, click on this picture for a photo album in Picasa (and a Flickr album is displayed below). Hi! Enter your email address to subscribe to this blog and receive notifications of new posts by email. Feed Subscription – Just Click! 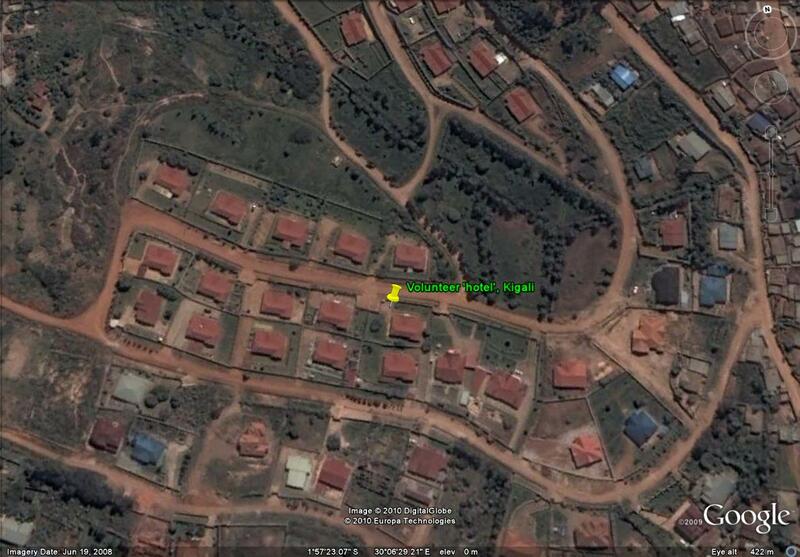 Living In Kigali (blog) Informative blog about – where else? And Because You So Wanted To Know . . .
Kiwi Links: "New Zealand Edge"' Did You Know These Ten Things About NZ?